Four-wheel drive electric-powered trucks are nowhere near as plentiful as their nitro-powered siblings are. 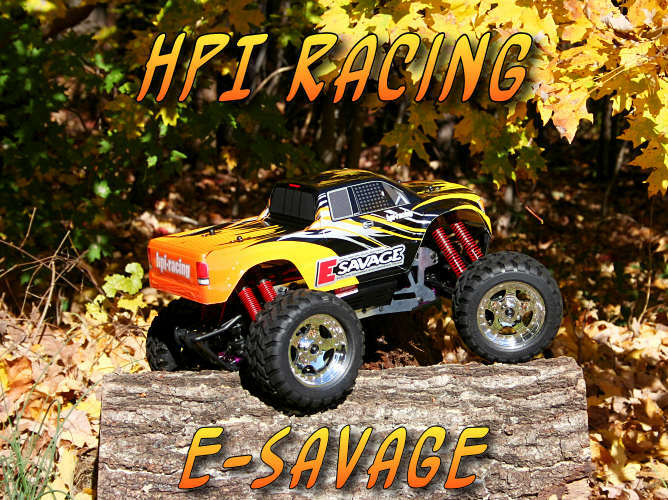 So when the HPI E-Savage was announced it caught the attention of many in the hobby. 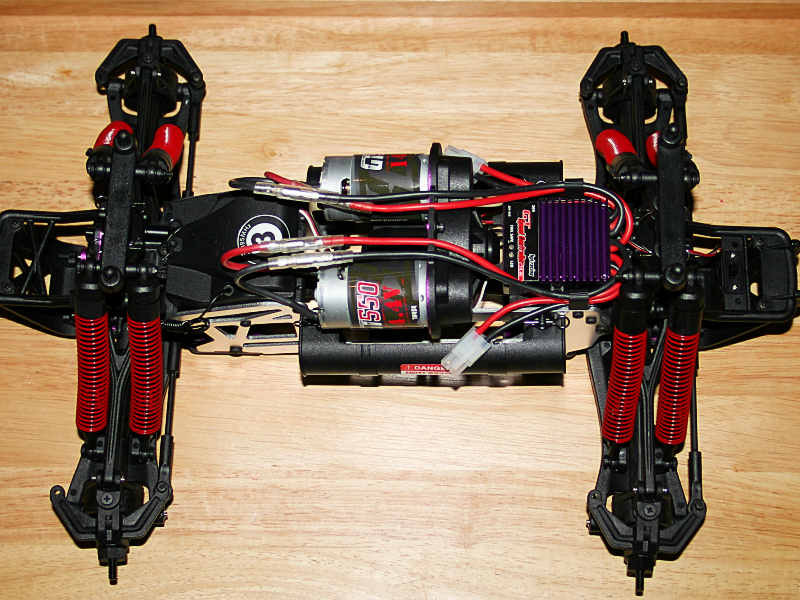 Many may recognize it as similar to the Hot Bodies E-Zilla, and with good reason. Given the ties between Hot Bodies and HPI it’s not a far stretch to assume the trucks have a lot in common. Given the fan base of the E-Zilla, that’s far from a bad thing as well! 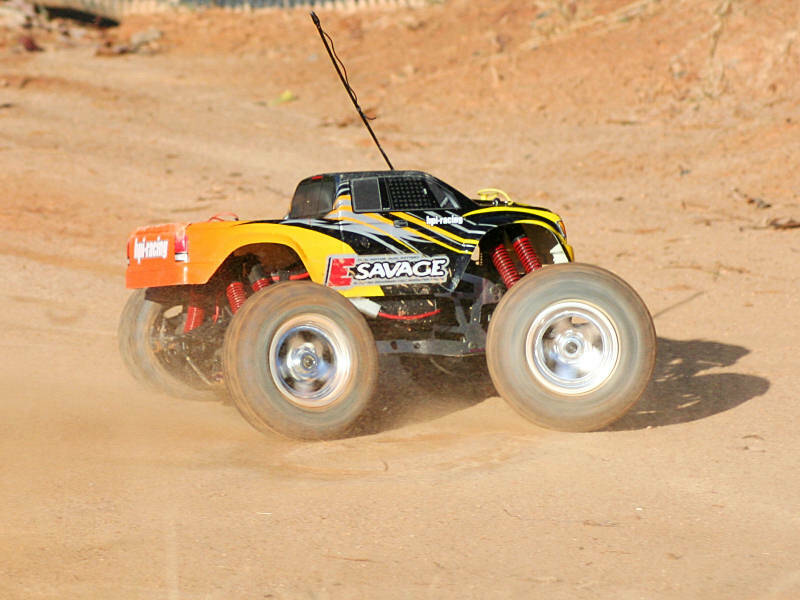 The E-Savage follows the current trend of four wheel drive trucks, using dual battery packs to provide a total of 14.4 volts to the 550-sized motors. 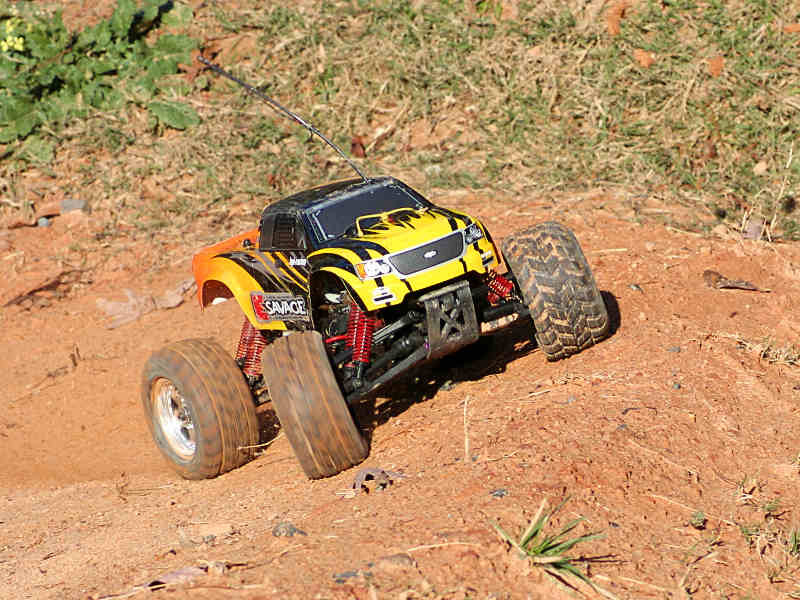 Where it tries to step away from other platforms is with its use of a twin vertical plate chassis and independent suspension, combined with the super-long shocks we all associate with the Savage. The 1/10 scale size of the truck also gives you a platform that is a little smaller and more nimble than the larger nitro-powered version of the truck. It’s often harder for an electric truck to invoke the excitement and rush that a nitro-powered truck can. The nitro-powered truck just adds much more of an overall sensory experience. However, that just means the electric vehicle has to provide a solid driving experience and intense level of fun factor. If it’s done correctly, an electric platform can end up leaving just as much of an impression on its owner. That’s what HPI is after, and it’s time to see if they deliver! You can’t possibly have a truck like the new E-Savage without having a body that can stir up just as much excitement as the new release itself. So you’ll find that HPI had that very concept in mind in the color scheme, and even applied all of the stickers and cut the body holes for you. The end result is a body that’s completely ready to go, and the bright yellow and orange against the black stands out and makes the truck very easy to see when it’s ripping up the dirt. 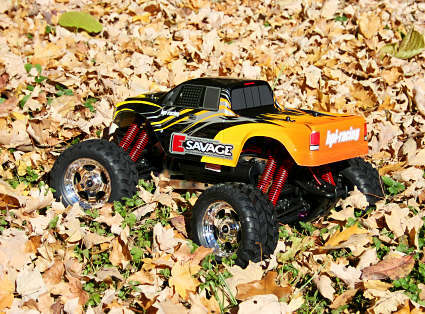 If the truck body isn’t your style, HPI offers the E-Savage with a brightly colored Baja buggy body option as well! Even though HPI uses black and white manuals with their vehicles, the information contained within them is very useful and relevant. Inside the manual you’ll find necessary information that helps you charge batteries, operate, and maintain the E-Savage. Exploded assembly diagrams help you get it apart and back together as needed. 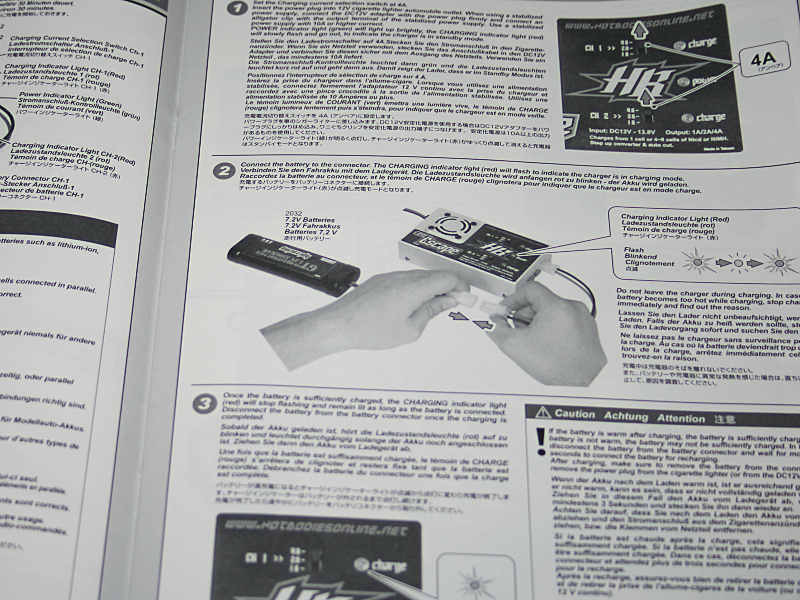 You’ll also find parts references in the manual, as well as on a separate sheet. Whether you’re a novice or a veteran, the included documentation is bound to prove useful. The release of an electric four-wheel drive truck is nowhere near as common as their nitro-powered brethren. Even rarer is an electric truck that comes as complete as the E-Savage. How complete you ask? 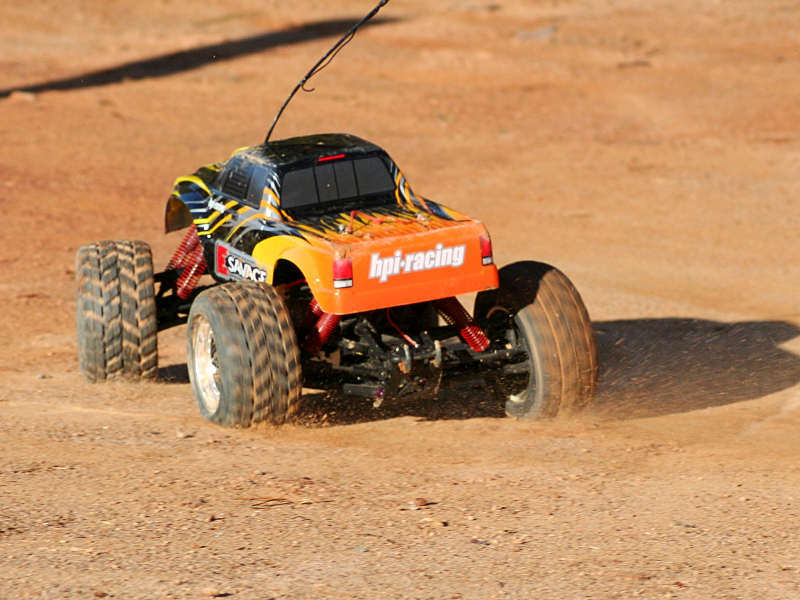 Well all you really need is AA batteries for the radio, as HPI throws in two stick packs and a charger to power the truck! Now that rocks! The batteries are labeled under the Hot Bodies brand, which has ties with HPI. They are standard 7.2 volt Tamiya stick packs, with a Mah rating of 3300. Since it takes two of these packs to power the truck with the necessary 14.4 volts, it would be futile to provide a charger that can only charge a single battery at a time. 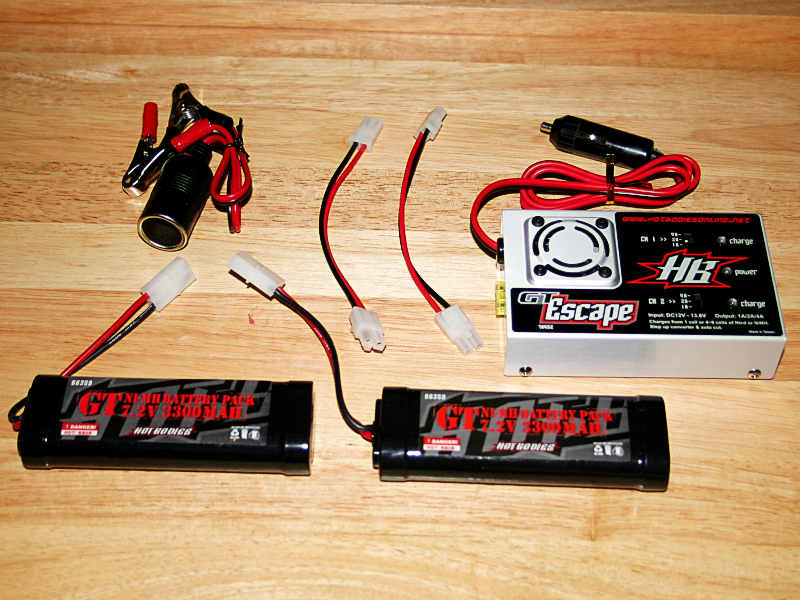 So HPI packages the Hot Bodies GT Escape charger with the truck. This charger can handle charging two packs at a time, at rates of 1, 2, or 4 amps. The only real fault with this charger is that it is a DC-only charger. So using an AC wall outlet is out of the question without having a separate power supply on hand. A few other charging related accessories are provided with the E-Savage. Two adapters allow the Tamiya-equipped packs to plug into the charger, as the charger unit itself uses a pair of smaller jacks. Also a power outlet adapter is provided as well. In the event you don’t have a vehicles power outlet handy, you can plug in the optional outlet straight to a battery or power source, giving you a place to plug the charger into. 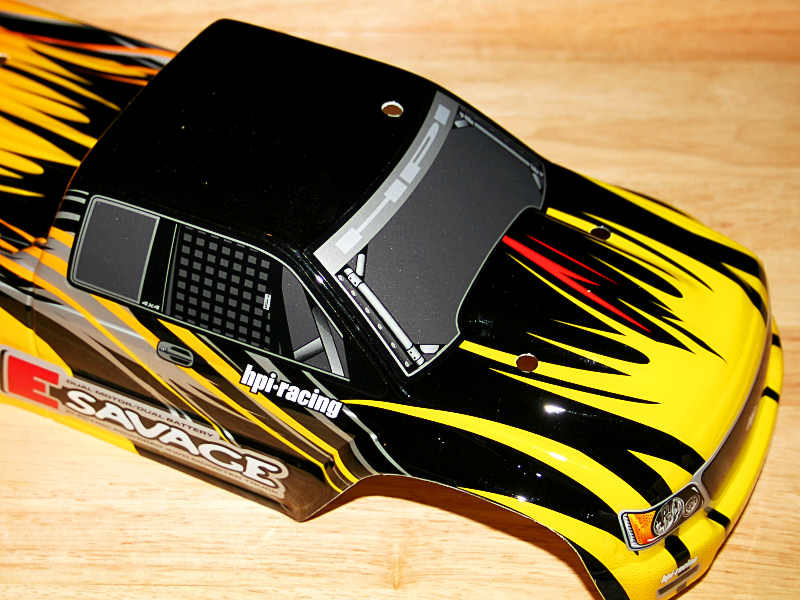 HPI includes a few other accessories with the truck as well. Two of these are additional body post assemblies, allowing you to use other optional bodies aside for the one that comes installed on the truck. A set of three L-shaped hex wrenches give you the basics for working on the truck, while extra body clips prove useful for the battery compartments as well as the body itself. Also you get an antenna tube and cap, as well as optional servo horns. 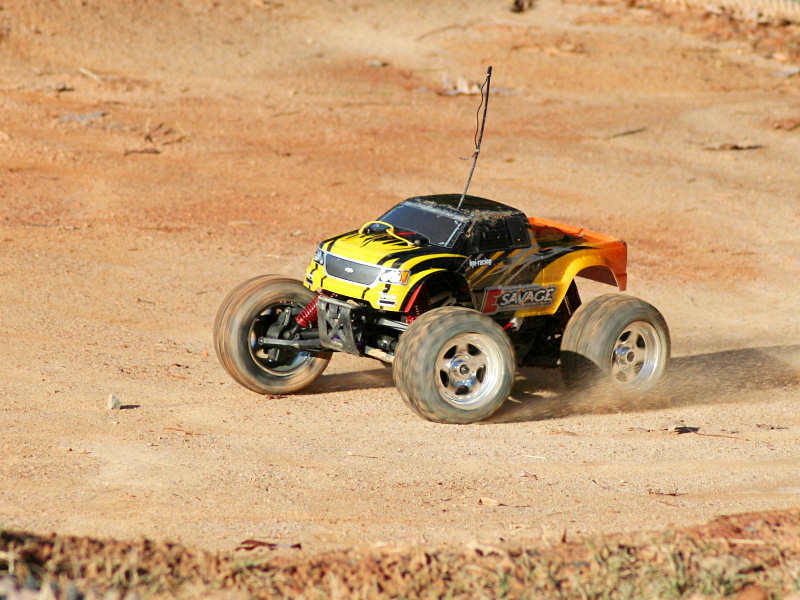 The E-Savage comes equipped with TF-3 radio, made by Futaba for HPI. The 27MHz two channel radio is a no frills unit, offering basic analog trim adjustments. 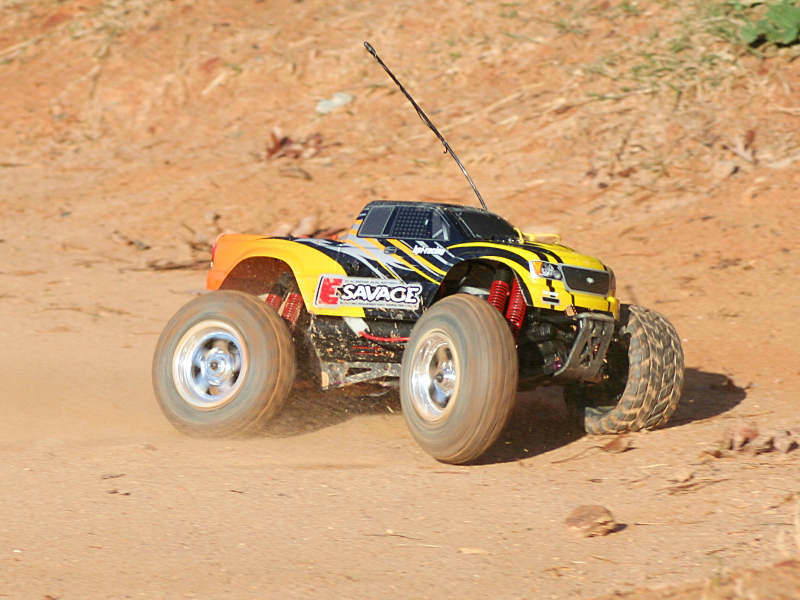 Its main feature is that it allows HPI to keep the cost for the truck at a competitive point. The radio should serve most novice hobbyists well, offering basic functions such as analog trims, servo-reversing, and dual-rate options. Eventually, more serious owners may look to upgrade the radio at some point in the future but the stock radio should be just fine to start off with. To those who have been following HPI and Hot Bodies releases for the last couple of years, the E-Savage probably looks familiar. The truck seems to be very heavily influenced by the Hot Bodies E-Zilla, but in reality it was meant to be the other way around. The E-Zilla was originally destined to be released as the E-Savage, but those plans were changed at the last minute and it was released under the Hot Bodies name. With Hot Bodies now refocusing itself towards racing the truck is finally making its way back over to HPI, where it was originally planned be released. From an appearance standpoint, the truck layout is identical to the Hot Bodies E-Zilla. 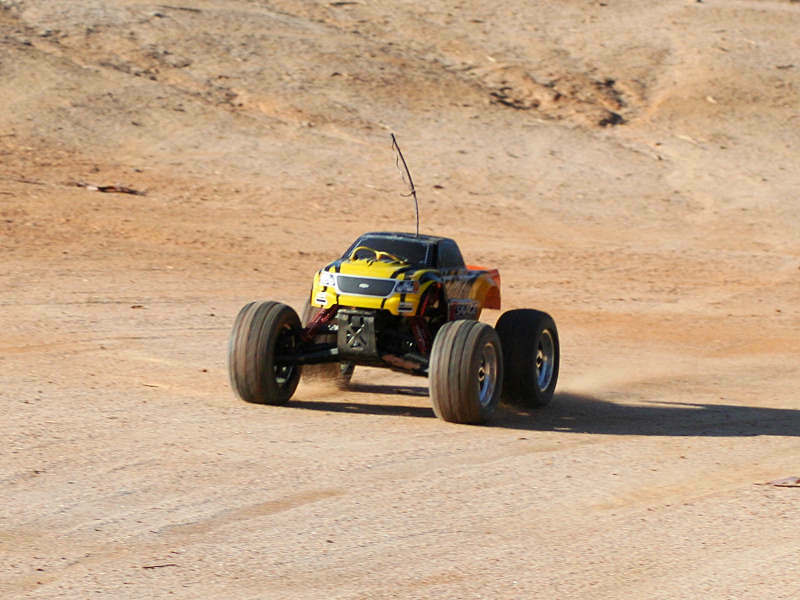 The most easily seen difference between the two trucks is the 3300Mah battery packs the E-Savage comes with. We saw these earlier. However, HPI took it upon themselves to beef up a few of the items found on the truck just to enhance some areas for additional strength. 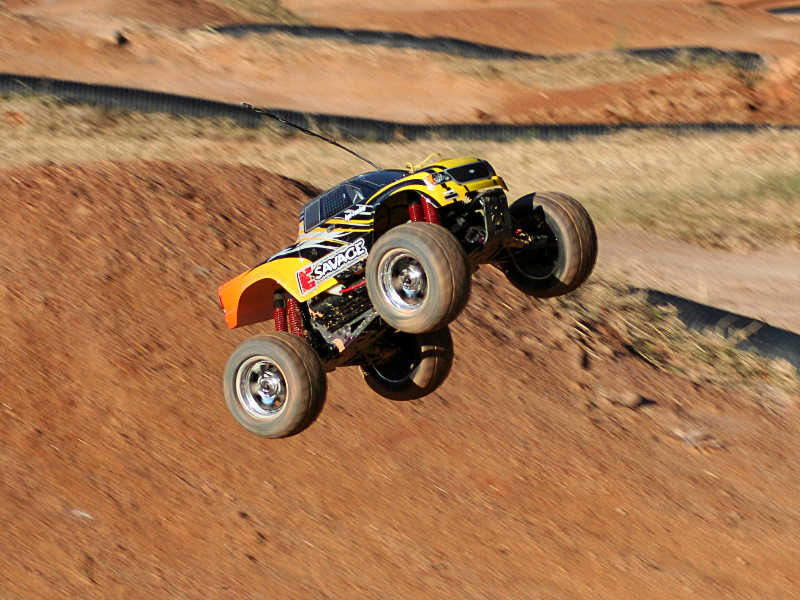 The E-Savage is a dual 550-motor four wheel drive monster truck. 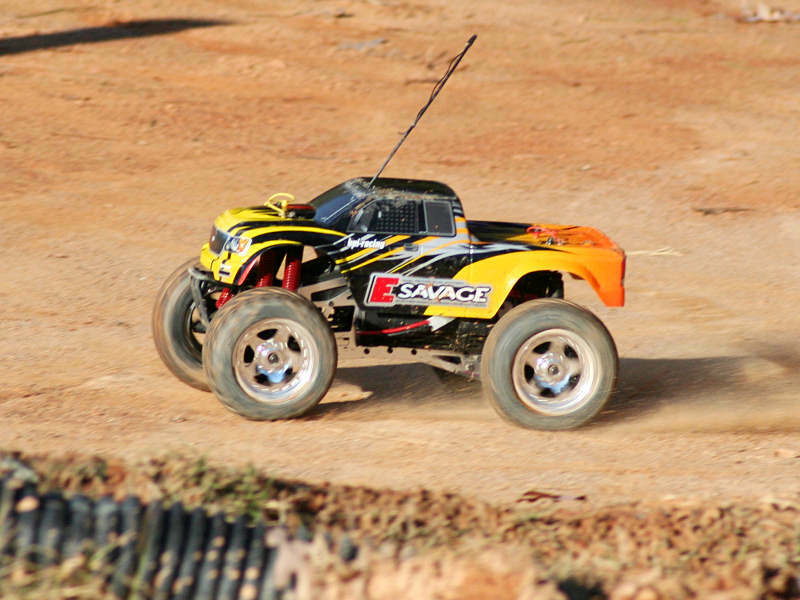 It uses the twin vertical chassis plate layout that is characteristic of their nitro-powered Savage truck. The batteries are contained on both sides of the truck in side openings, which help to keep the weight of the battery packs close to the ground. This helps provide a lower center of gravity. While we’re still talking about a monster truck, not a corner carving touring car, HPI tried to give the E-Savage the ability to corner well without being too top-heavy. Towards the rear of the truck you’ll find the electronic speed control. Up front, housed in a receiver box, is the 27MHz AM receiver. A power switch is found at the rear of truck, mounted in the bumper. A similar bumper is found at the front of the truck, with both bumpers being made very flexible so they help to absorb impacts. As you’d expect, the super-long eight shock setup is found on the E-Savage, just as it is on the nitro-powered version of the truck. From the underside of the truck you can catch a glimpse of the plastic slider-style driveshafts that are used on the E-Savage. The transmission is mounted in between the dual vertical plates, serving to further reinforce the chassis assembly. Lower aluminum plates serve this purpose as well, and are covered with plastic skid plates to protect their finish. One of the most recognizable characteristics of the Savage has always been the super-long eight shock suspension system. So it’s nice to see this facet of the nitro-powered truck has made it’s way over to the 1/10 scale electric version as well. 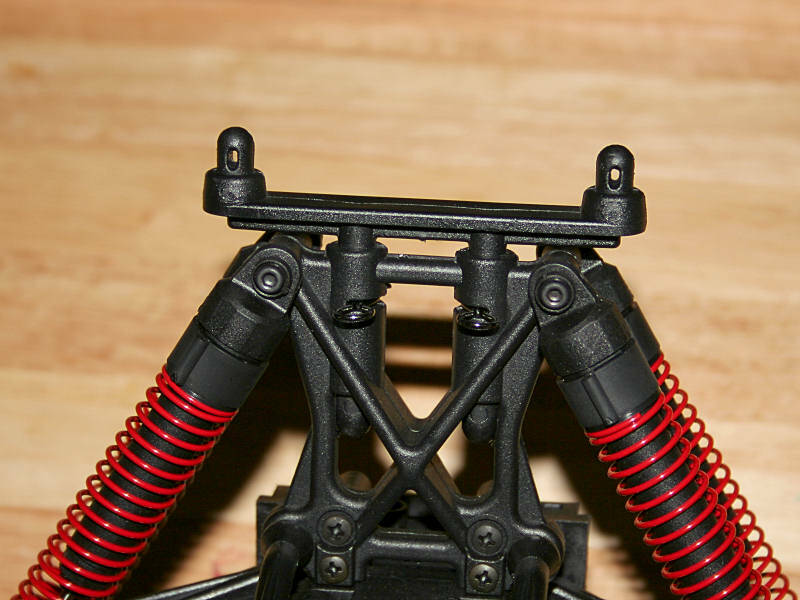 The super beefy shock tower provides a single mounting point for the upper end of the shocks, while the lower end gives you two possible mounting configurations. 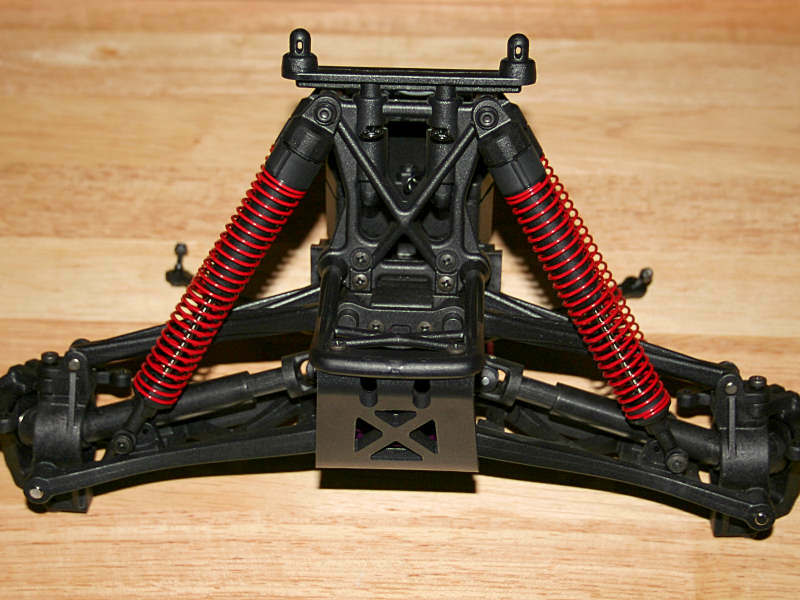 The body mount slides into the shock tower, and is adjustable. A pair of body clips locks it into the height position of your choosing. 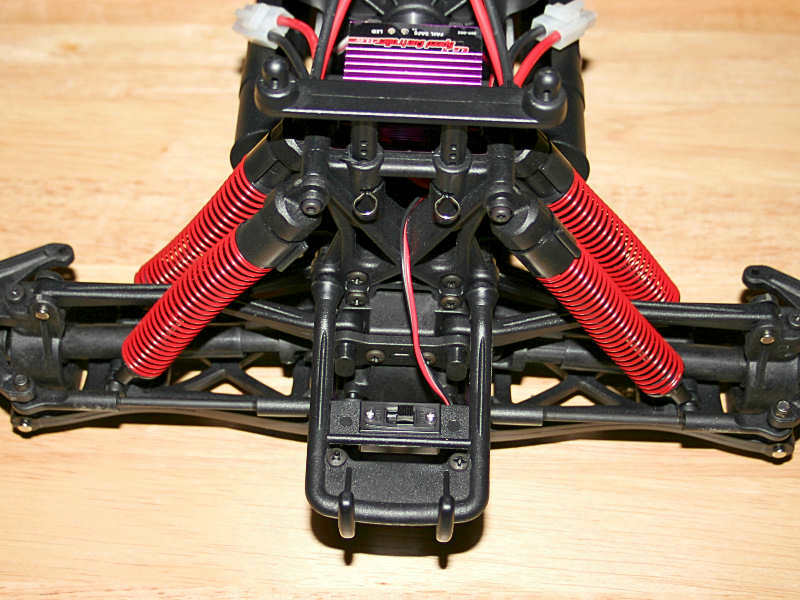 The basic layout of the E-Savage’s suspension is very similar to its nitro-powered sibling. The sizes of the various components vary slightly from the larger truck though, as the E-Savage is slightly smaller. The stock driveshaft is a plastic slider unit, providing an excellent balance between strength and a lightweight driveline. The end of the axle features a steel axle stub that has a diameter of 6mm, and rides in an outer bearing that measures 6x12x4mm. The inner axle stub bearing has dimensions of 10x15x4mm. 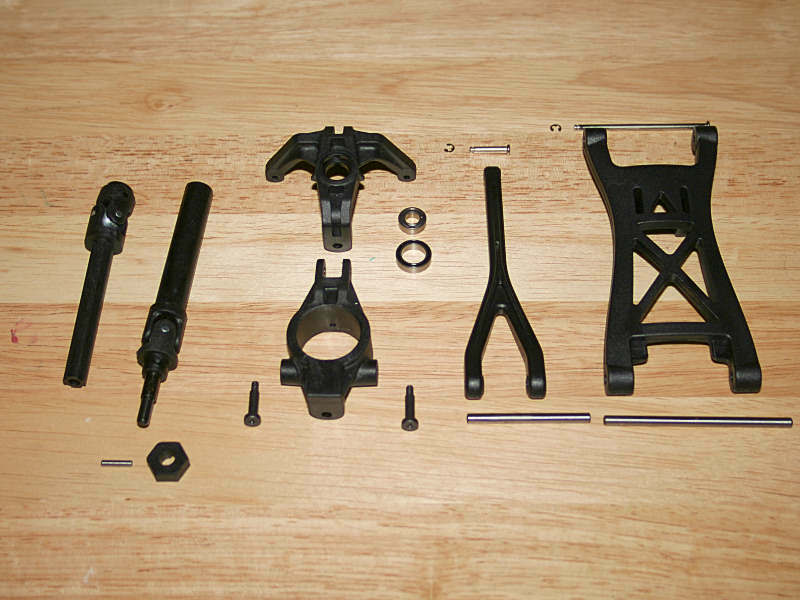 The hex adapter is 14mm, and is pushed down over a 2.5mm axle pin. A pair of vertical screw pins allows the steering block to pivot in the c-hub. The lower suspension arm is designed and reinforced with strength as a primary consideration. The upper arm is y-shaped, and provides a fixed camber angle. 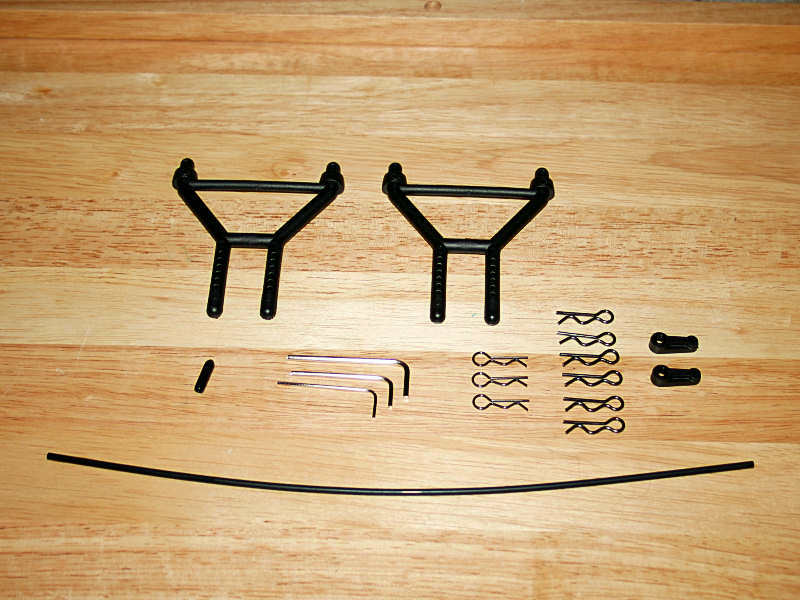 The suspension arms are universal at all four corners of the truck, making it easy to have replacement parts on hand. The inner suspension pins are 4mm in diameter, and the outer pins 3mm. The outer pins have a head on one end, while an e-clip locks them into place. The inner suspension pins are trapped into place on the bulkheads, eliminating the need for e-clips. I can’t help but reflect back upon the general concept for the Savage X when examining the front bumper for the E-Savage. The bottom of the bumper is a protective plate which fastens down over the aluminum skid plates, and then is held tight by countersunk screws. The upper portion of the bumper is made to quickly pop loose from the bulkhead assembly, as it’s held in place by two plastic clips. This allows you to easily pull the upper section of the bumper out of the way, in the event you need to access the roll center adjustment, or even the differential. The bumper offers protection to the truck as well, as it’s made to flex and absorb any impact it encounters. The rear bumper is setup nearly the same as the front bumper. The difference is the fact that it also houses the truck’s power switch. This switch placement makes flipping the truck on and off extremely easy when compared to switches that are placed on the chassis itself. 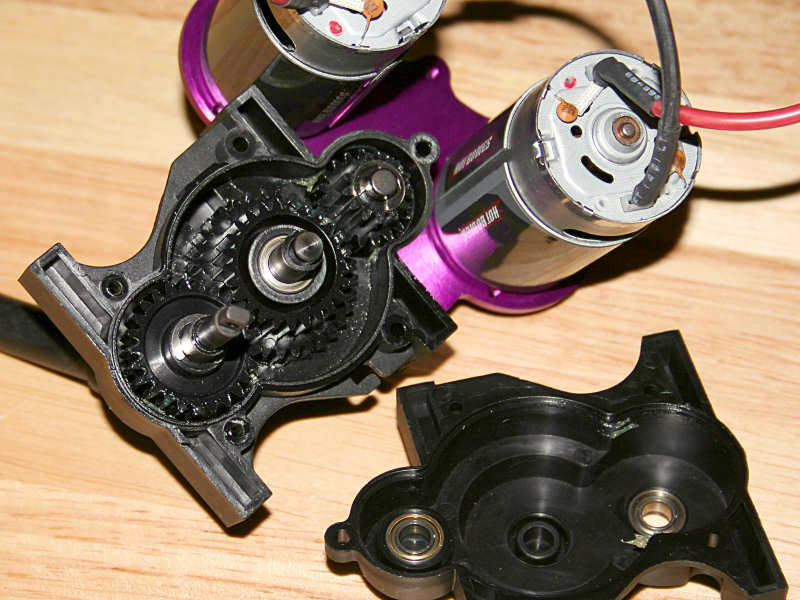 The steering assembly utilized by the E-Savage is a bellcrank assembly. The whole assembly, including the steering servo, can be removed from the vehicle rather easily for inspection or maintenance. Servo protection is provided by the servo saver mounted on one of the posts. The servo saver’s tension is adjustable via an aluminum thumbwheel. An HPI SF-2 servo provides the steering motion with a rating of 90 oz-in of torque at 6 volts. I would have preferred to see adjustable turnbuckles used on the steering and toe links rather than the threaded rods that were used. Turnbuckles would allow for quicker adjustment of the front toe angle, without the need to remove the steering links before adjustment. Inside the bulkheads you’ll find a differential with hardened steel gears. The bottom of the bulkhead is open to allow easy access and inspection, while shims set proper gearing backlash between the ring and pinion gears. Screw-in pins hold the axle’s output yokes onto the differential. 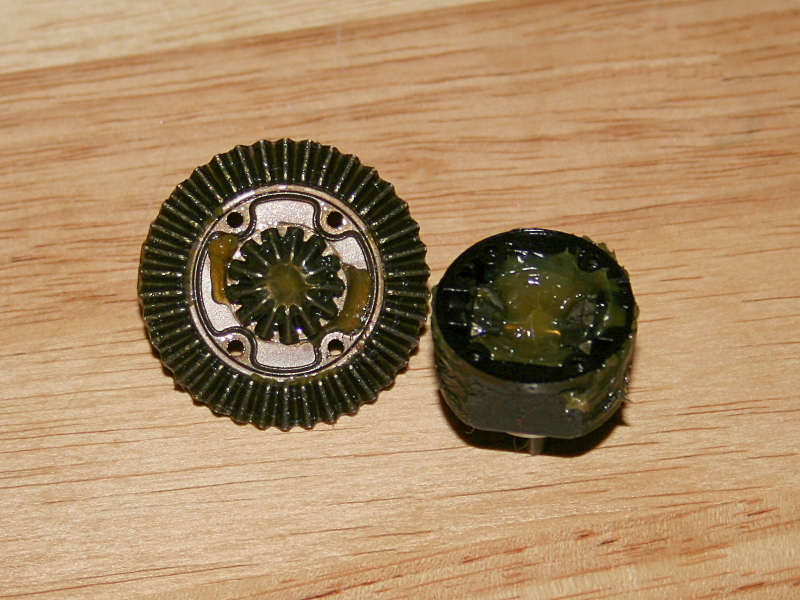 Plenty of grease on the gears helps keep wear at bay, as the differential spins on a pair of 10x15x4mm bearings. The differential housings, or bulkheads, split into front and rear halves. This makes removal easy from the front or rear of the truck. 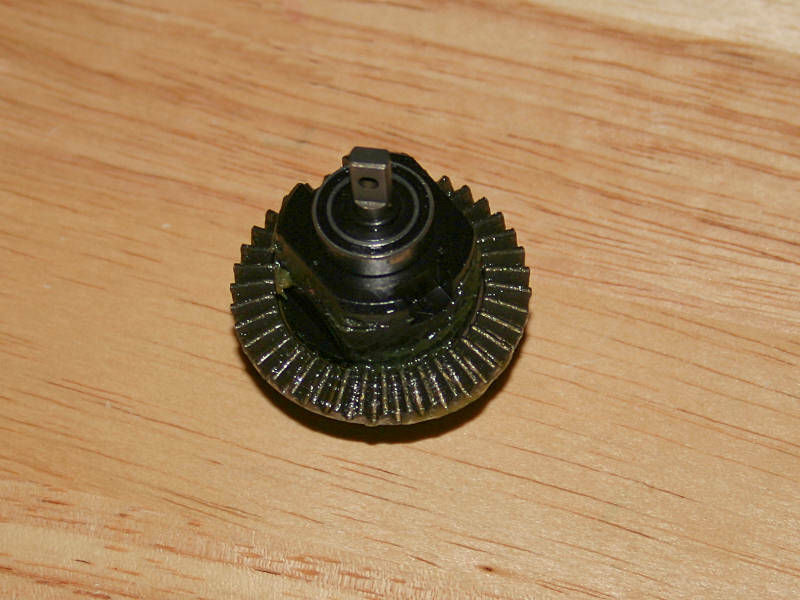 The pinion gear passes through the rear bulkhead and rides on a pair of 5x11x4mm bearings. 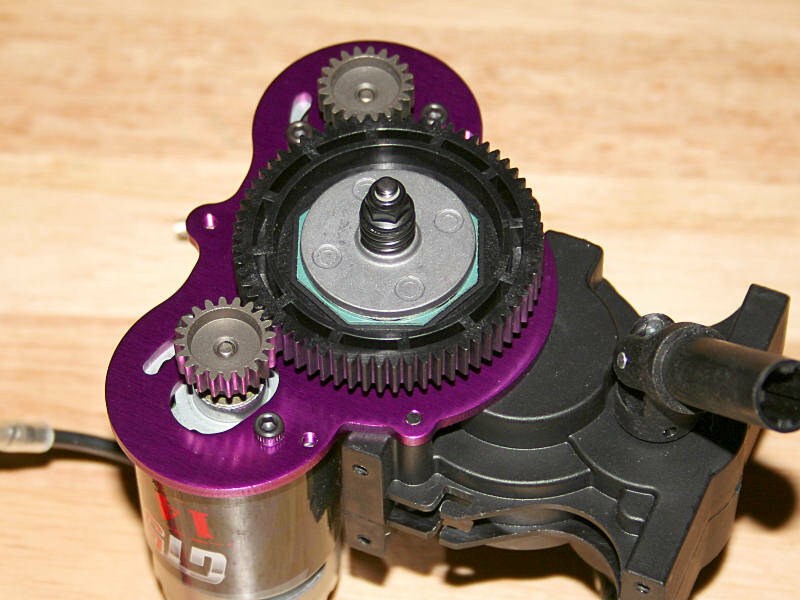 The differential uses a plastic cup, and features a four gear setup inside the cup. 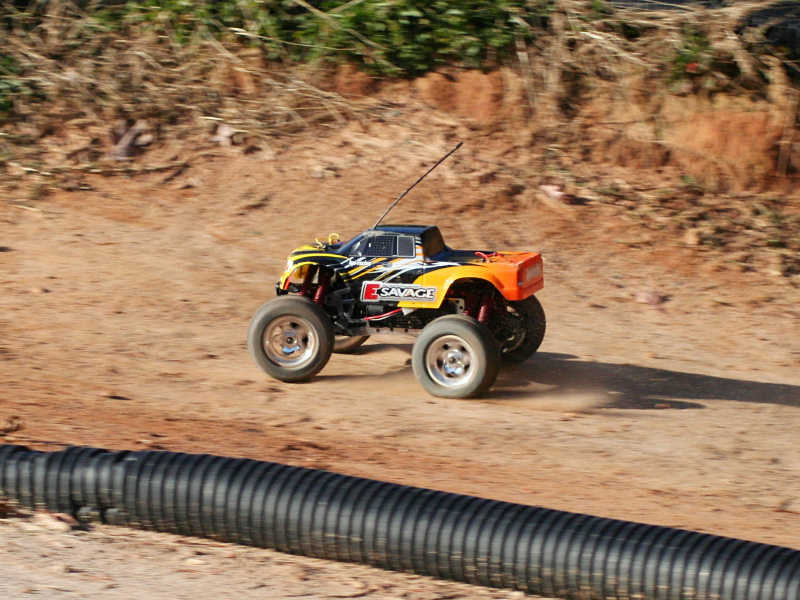 The nitro-powered version of the Savage uses an internal six gear setup, but the configuration used on the E-Savage should easily handle the power and speed provided by the dual 550 electric motors. The differentials aren’t sealed for silicone oils, so they are filled with grease from the factory. 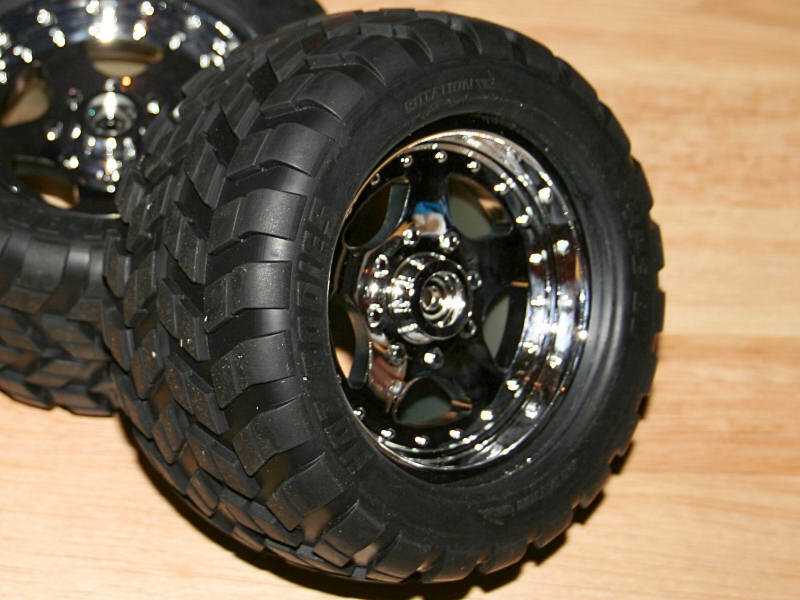 The tires for the E-Savage are mounted on a set of chromed plastic five-spoke wheels that really look sharp against the colors on the truck’s body. The tires use a block-style of tread, which is lined up in a v-style directional pattern. 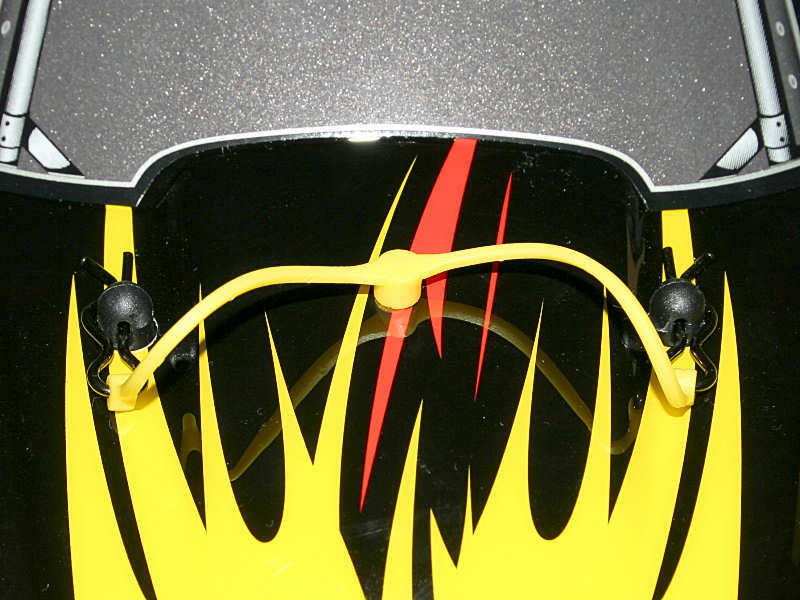 The stock rubber is branded with Hot Bodies, again showing us the ties between Hot Bodies and HPI. Foam inserts help the soft rubber tires keep their shape under the weight of the truck. The shocks on the E-Savage keep their characteristic long length that’s found on the original Savage trucks. 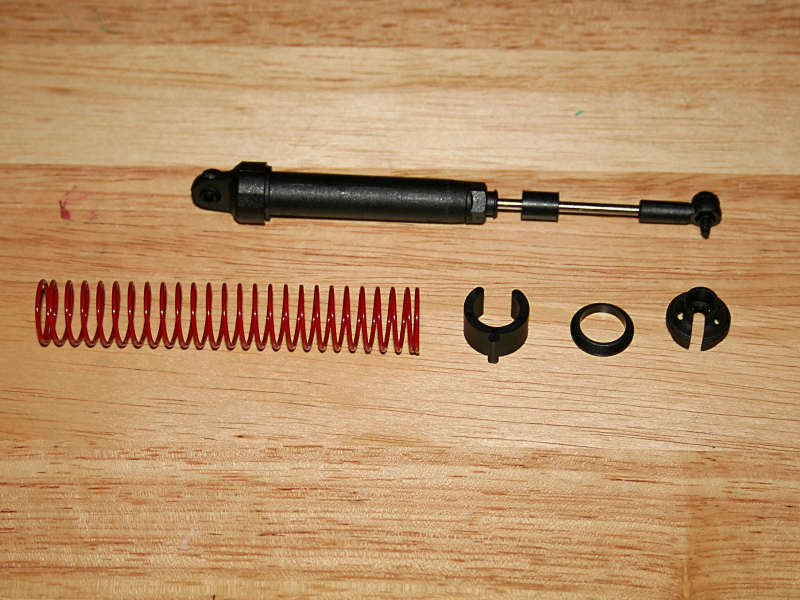 The shock body and cap are composite plastic, with a 3mm stainless steel shock shaft. 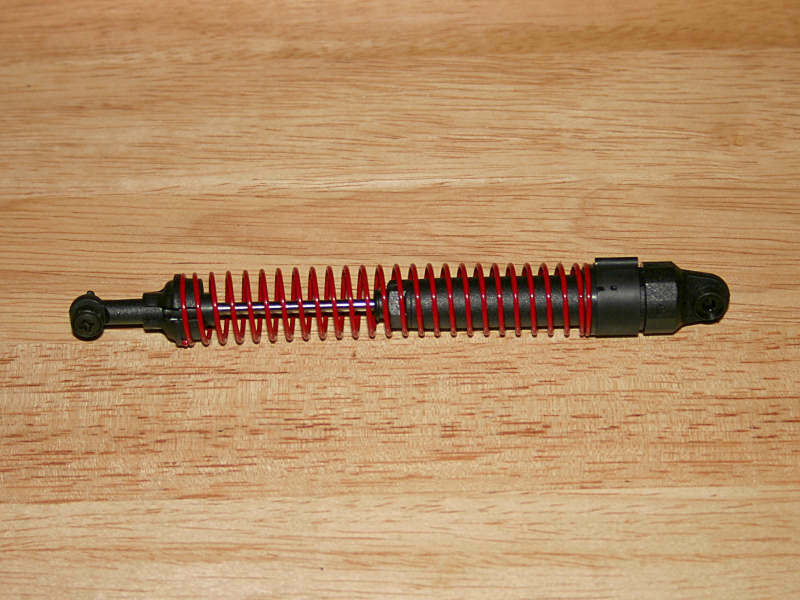 A rubber insulator placed on the shock shaft prevents the shock from bottoming out harshly and damaging the shock on large jumps. Plastic clip-on preload spacers allow you to tailor the truck’s ride height to your liking. The receiver box is near the front of the truck as we saw earlier. 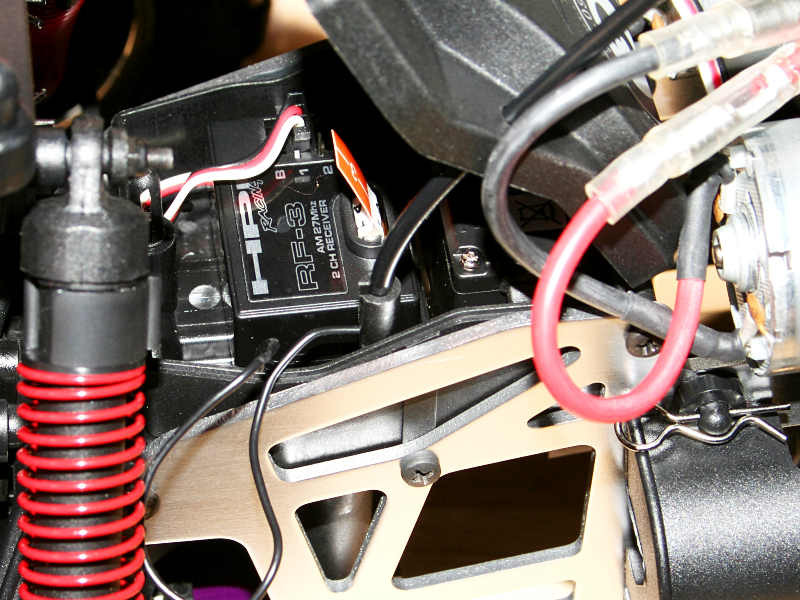 The box offers plenty of room for the receiver, and the steering servo which pokes through the underside of the box. The stock AM receiver operates in the 27MHz frequency range, and as you’ll notice mine utilizes channel 3. 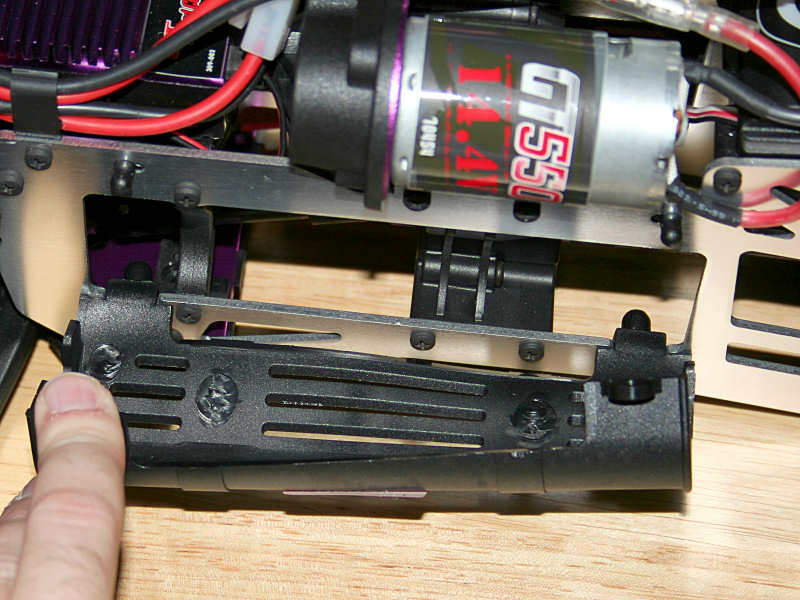 You’ll be happy to note that the receiver box is easy to open up as well, avoiding the trait that haunted the early versions of the Savage where the receiver box was positioned up against the front shock tower. Mechanical speed controls have went the way of the dinosaur; nowadays to be taken seriously an electronic speed control needs to be installed on a vehicle. 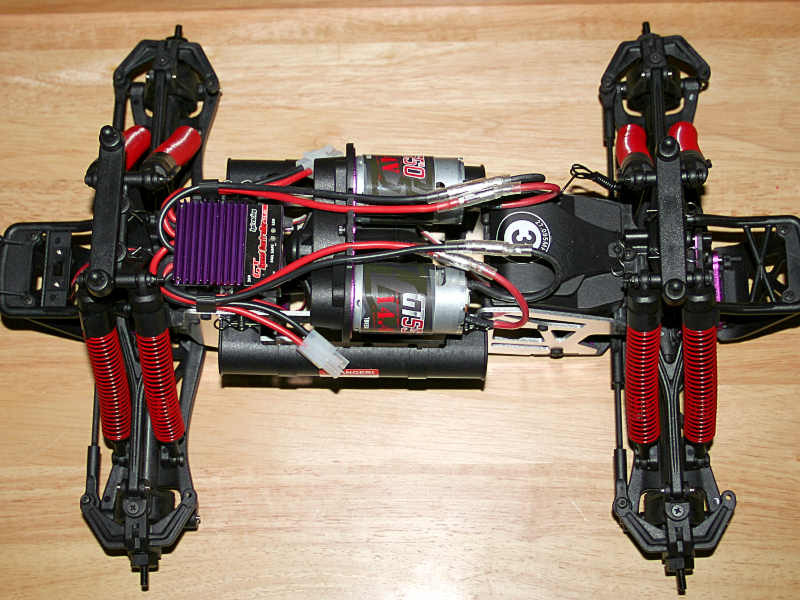 HPI delivers with their GT Speed Controller. 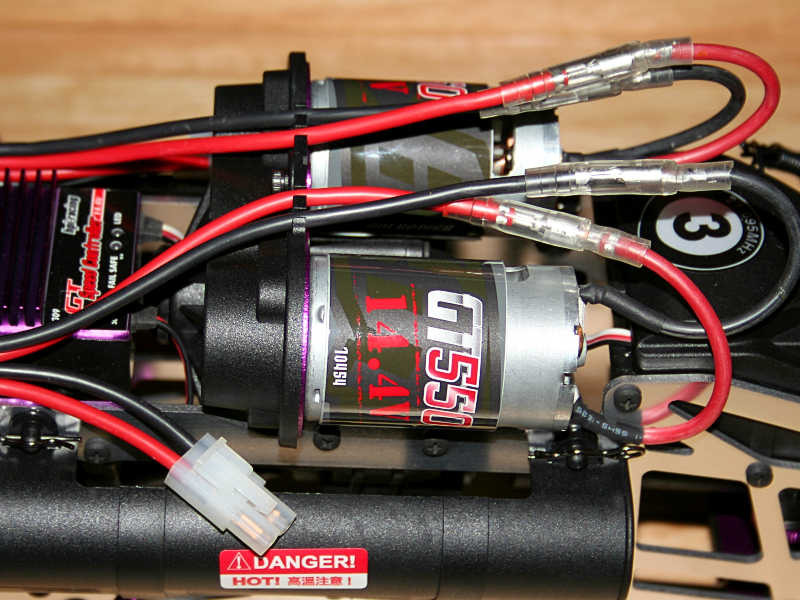 This ESC provides a full 14.4 volts to each motor, giving each of the twin motors the capability to produce tons of power. This pushes the truck over the 25MPH mark. The speed control features an automatic setup, which it performs each time it’s powered up. During these few seconds you should avoid moving any of the controls on the radio. Once you hear a quick series of beeps, the speed control is ready for action. A built-in failsafe function protects the electronics in the event of overload, and the heavy duty wires provide the capability to handle the current loads the truck needs with minimal resistance. Sharp eyes may notice a rectangular cut in the label around the ‘G’ in GT. Underneath you’ll find pins to provide 7.2volts of power. You can use this to power a cooling fan, LED headlights, or whatever else you can dream up! 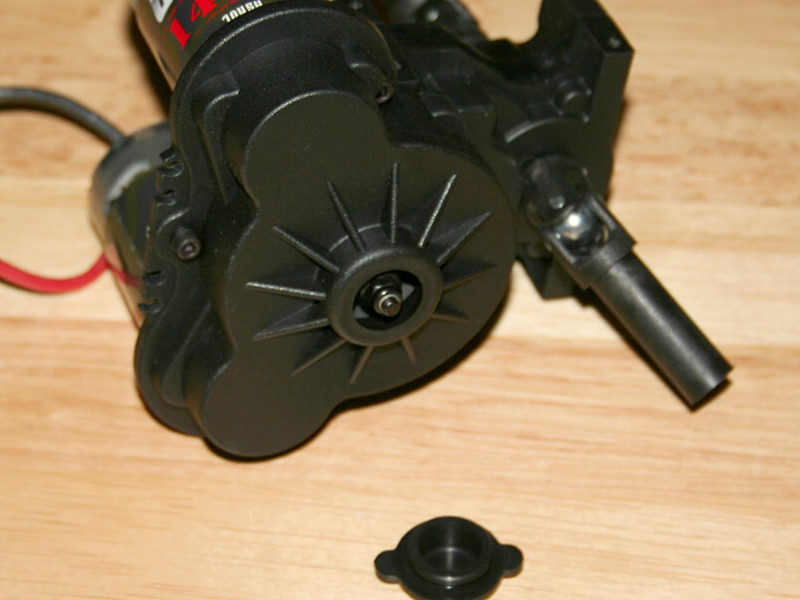 The speed control is mounted on a plastic mount, and is secured via two screws. 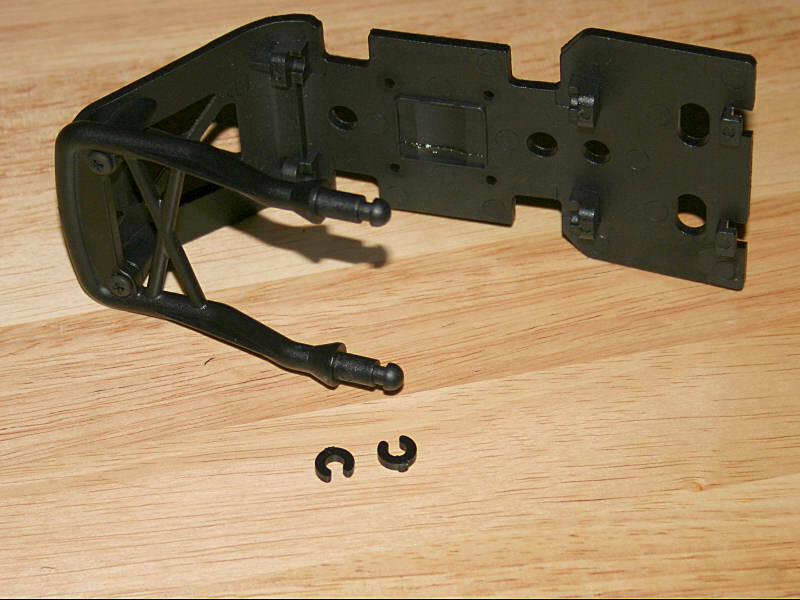 This mount also reinforces the 2.5mm thick chassis plates as well. 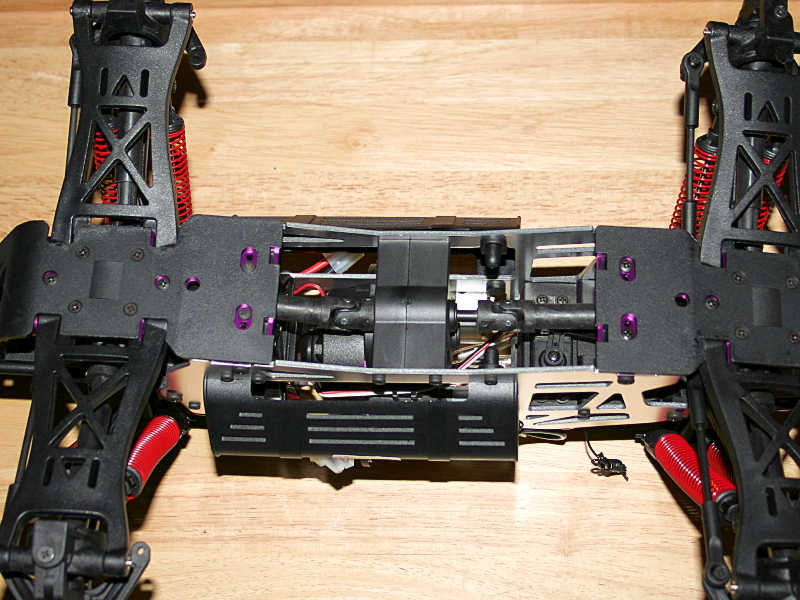 The sides of the chassis plates feature rectangular cutouts to hold the batteries. Placing the batteries in the chassis in this manner helps to keep the truck’s center of gravity low. 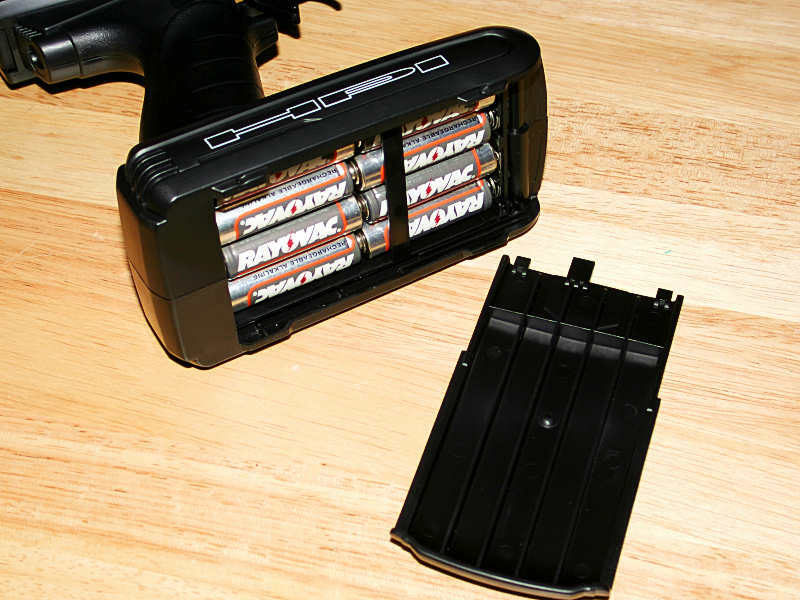 Two plastic covers are used on each side to securely hold the batteries in place. 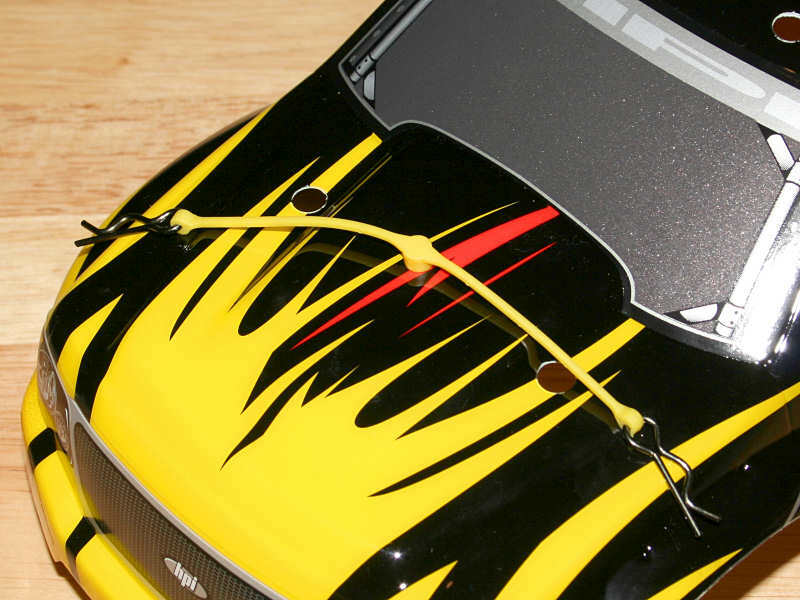 Body clips are used to hold the battery covers securely closed. 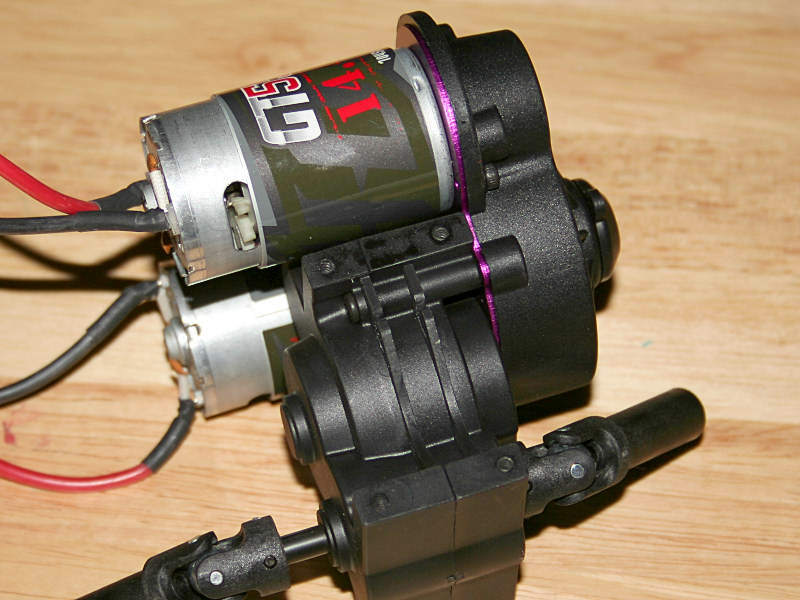 As mentioned previously, the E-Savage uses a pair of motors to provide the power to the wheels. 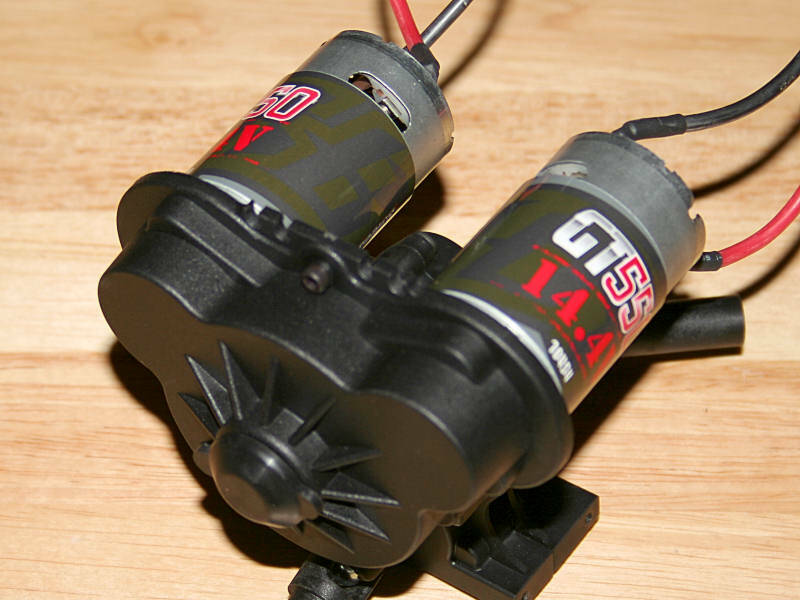 The electric motors use a 550-sized can, and are given a full 14.4 volts of power from the speed controller. The closed endbell motors feature fan blades mounted on in the armature shaft to enhance airflow through the motor and keep it cooler. 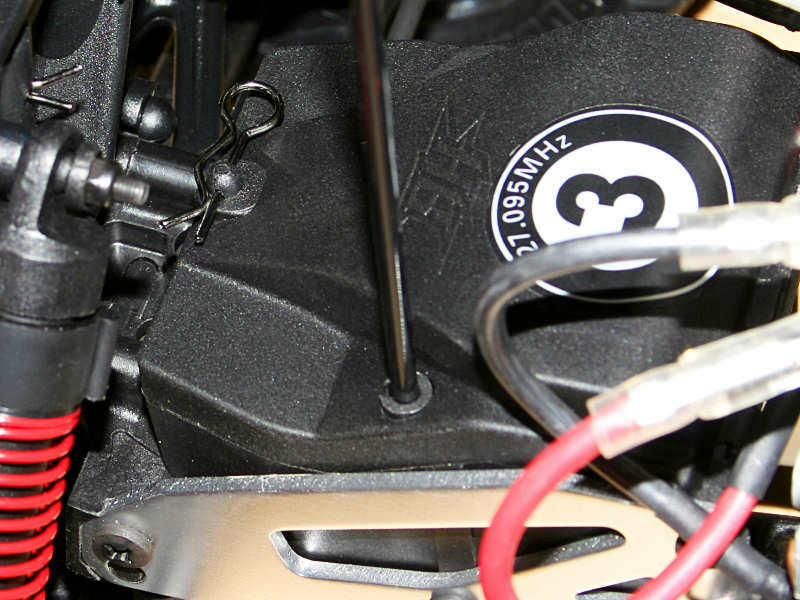 The motor wiring is neat and clean, thanks to clips molded onto the transmission housing to hold them. Bullet connectors allow you to easily separate the various electrical components if it becomes necessary. 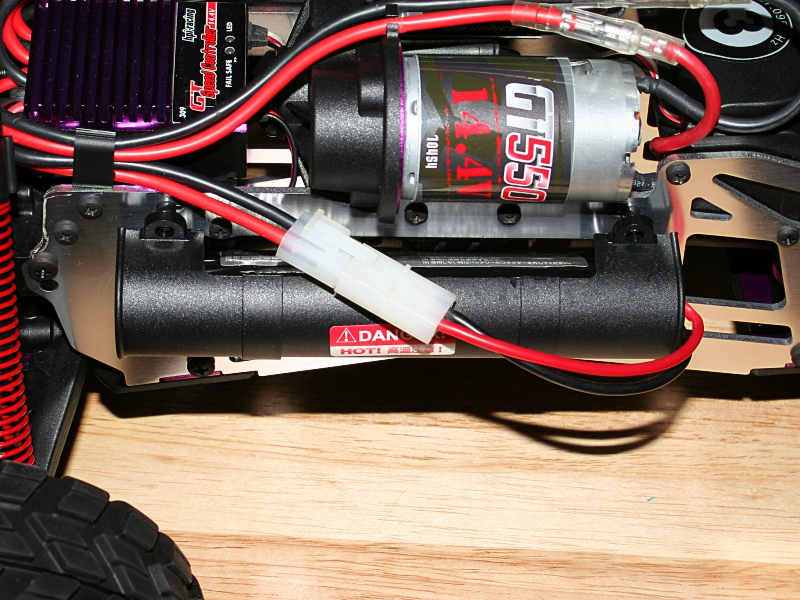 To protect the internal transmission gears, HPI equips the E-Savage’s driveline with a slipper clutch. The slipper clutch is located underneath the spur gear cover, but it isn’t necessary to remove the whole cover to adjust the slipper. Instead, quick adjustments can be made by removing the rubber plug in the center of the cover. Not only are the power wires neatly routed, but this approach even rolls over to the control wire for the speed control as well. 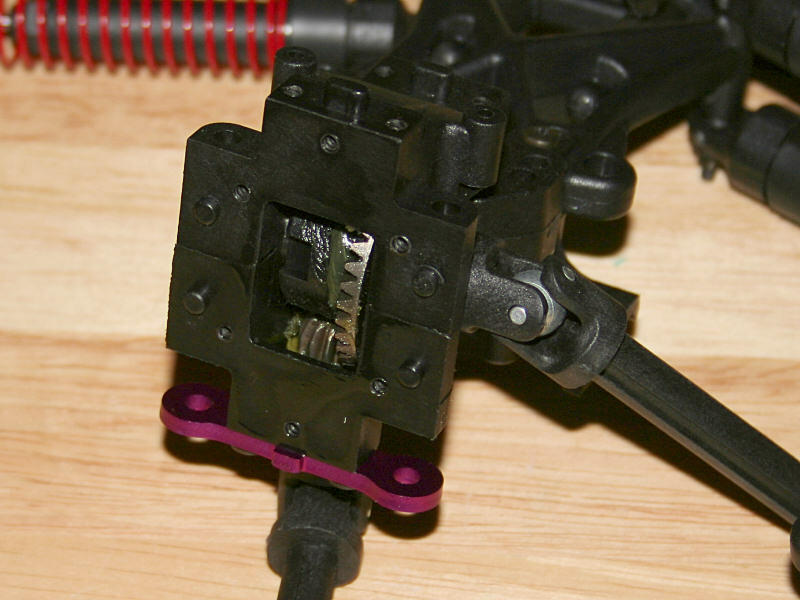 These retaining clips on the transmission’s housing keep the wire running from the receiver to the ESC out of harms way, as well as maintaining a neat appearance. 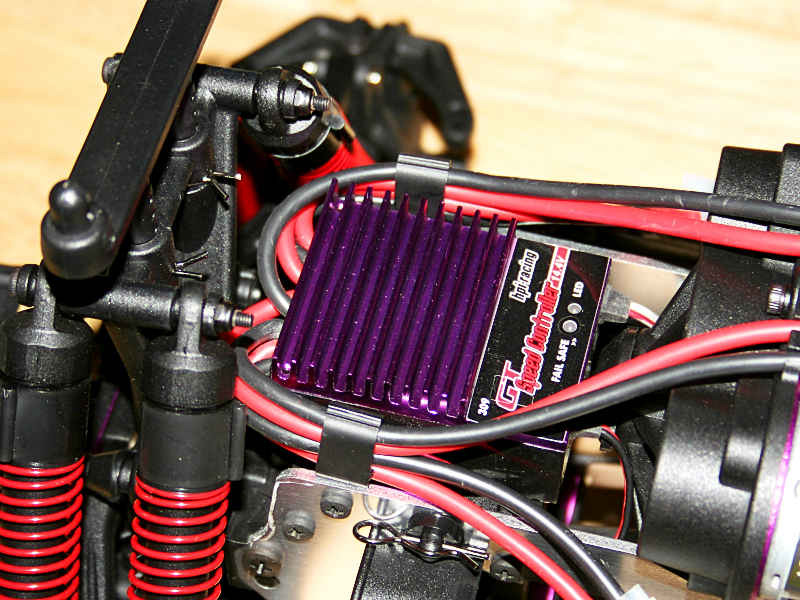 The motor mounting plate is aluminum and anodized in the standard HPI shade of purple. 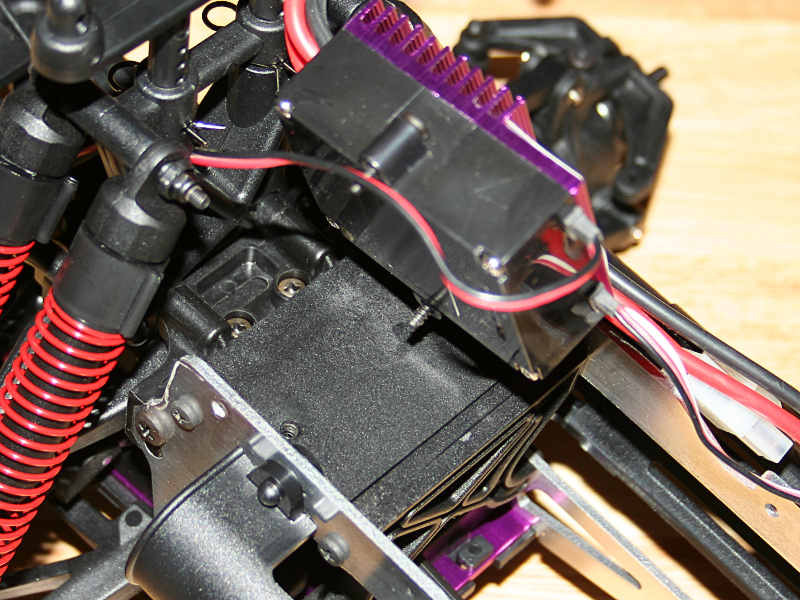 Slots on the plate allow you to adjust the motors for a proper gearing mesh. The plastic spur gear uses a disk-style slipper clutch to protect the drivetrain from sudden shocks that could damage the driveline. 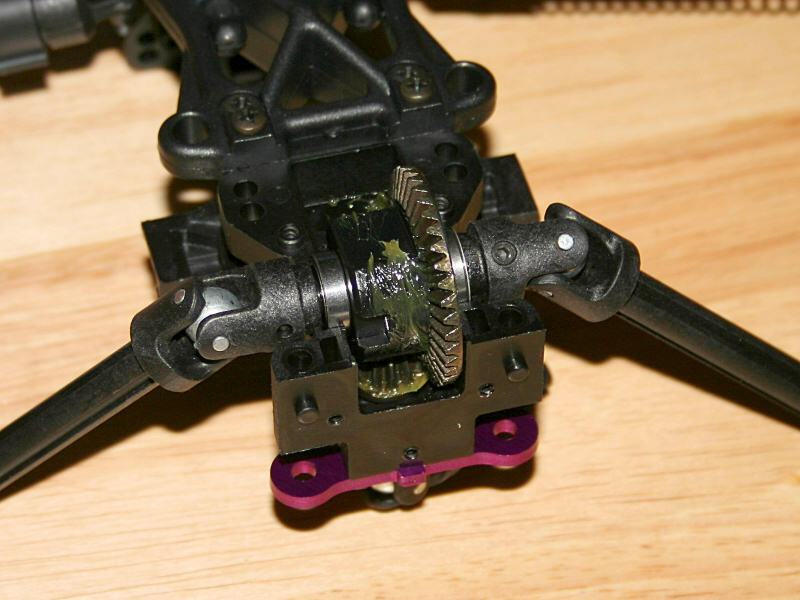 The transmission gears for the E-Savage are plastic, but beefy enough to handle the power that they send to the driveshafts. The slipper clutch also assists in this regard, in the event you run the E-Savage on a high traction surface. 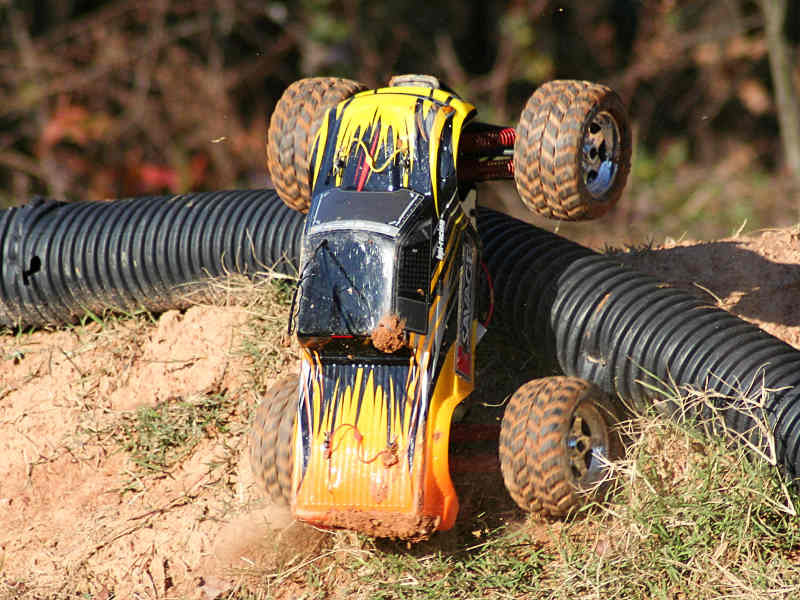 To keep the internal gears rotating smoothly, HPI provides full ball bearings for the transmission. 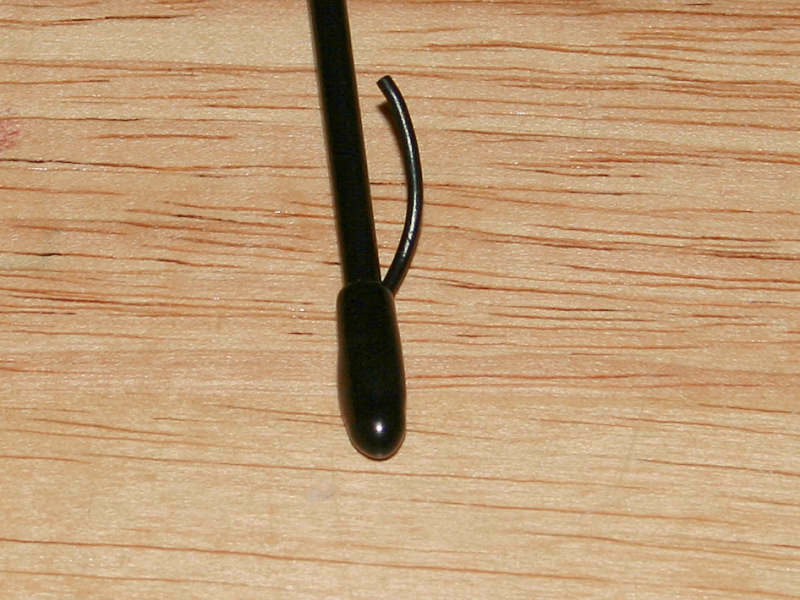 The first thing I did to prepare the E-Savage was to slide the receiver’s antenna wire into the antenna tube. The wire should slide through the small length tube with little effort, but if needed you can sprinkle a little baby powder on it to make things easier if needed. Once the wire is in the tube, push the tube into its resting spot on the inside of the box. Make sure that the antenna will pass through the hole in the lid, and the secure the lid with the supplied body clip. Next use the supplied cap on the top of the antenna tube to protect the wire, and to hold it in place. Before running the truck, you’ll need to charge the supplied battery packs. I used the charger that came with the E-Savage, as it makes quick work of charging both batteries due to the fact it can charge both at one time. Expect charging times for the 3300Mah cells to take around 45minutes with a 4amp charging rate, if the pack is nearly depleted. To extend the fun you’ll probably want to have a few more battery packs on hand. Charging times for those will vary depending upon the Mah rating of the pack. Always make sure to use paired packs rated the same voltage, and Mah, with the E-Savage. When the packs are charged, slide them into their respective spots on the sides of the truck. 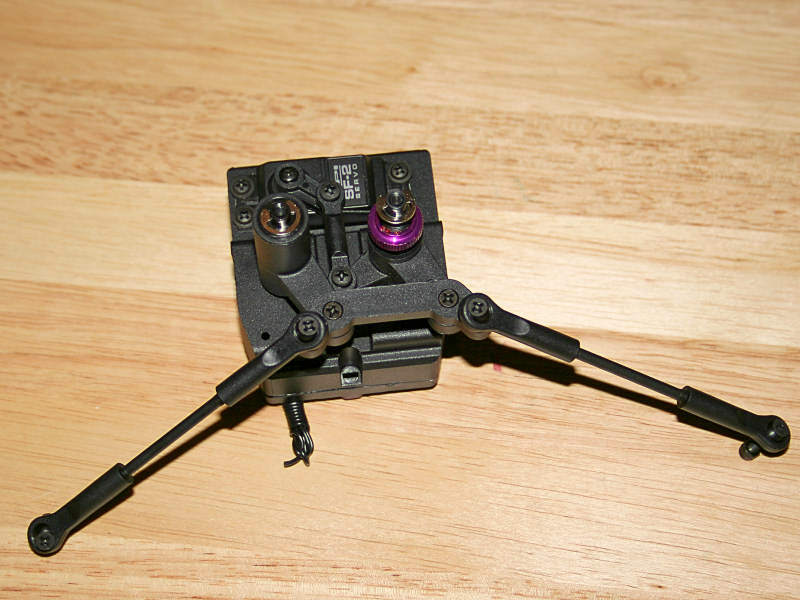 Use pairs of the supplied clips to secure the battery holders in place. Then make sure the truck’s power is off, so you won’t prematurely discharge the packs. 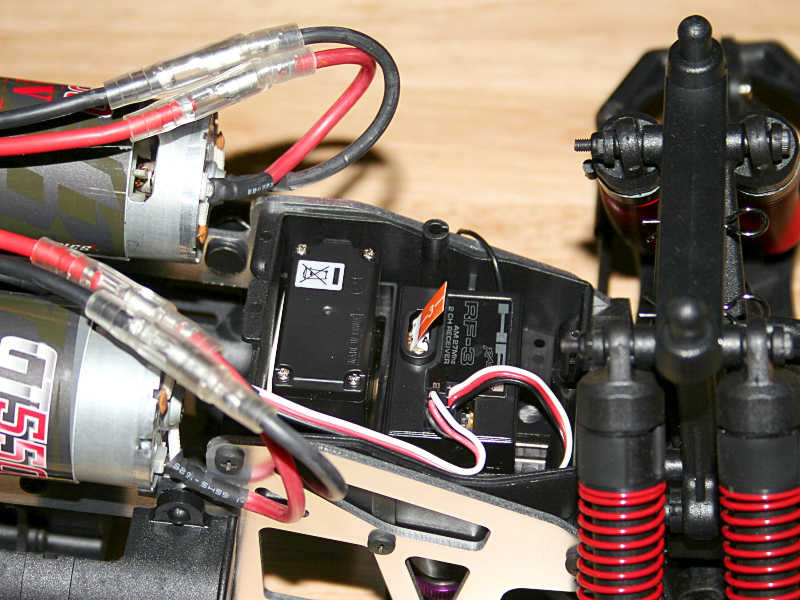 Then plug the battery packs into the ESC. Since you’re working with the battery packs, this would be a good time to address the batteries for the radio as well. 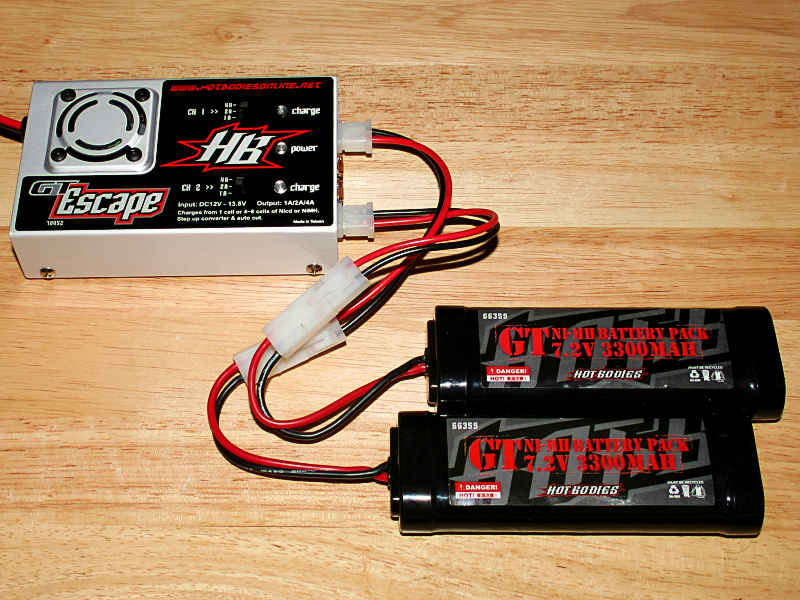 Place a full set of 8 AA batteries into the HPI AM radio. I recommend the use of good quality AA cells for this task, as weak or cheap cells could affect radio range and operation. If you would rather use rechargeable cells, you’ll needs to make provisions to charge them separate from the radio. 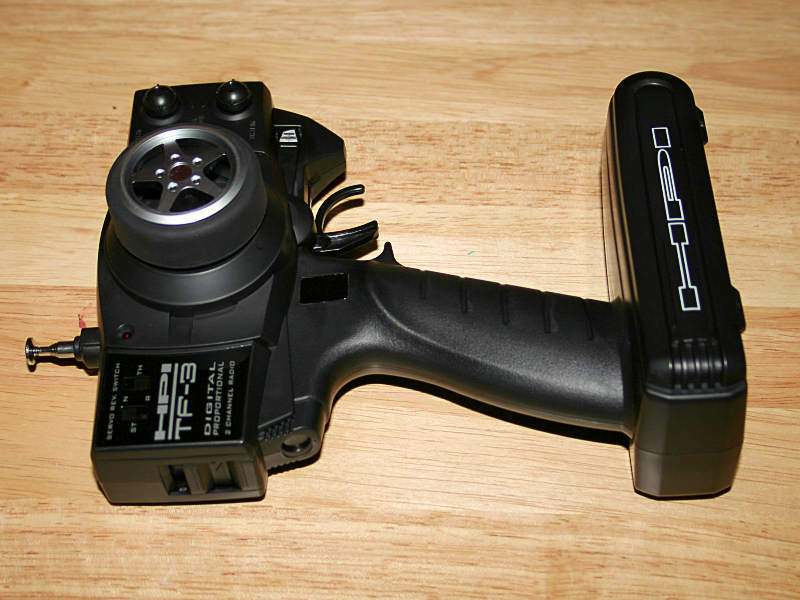 The included HPI TF-3 radio doesn’t provide a charging jack. I also added a set of Dubro Klip Retainers onto the body for the E-Savage. I love these retainers, as they prevent the clips from getting lost, whether it’s while the truck is being run or in the pits. I used the yellow ones, which are listed as Dubro part number #2247. I also ran some Zap CA glue between the wheel and the tire to ensure that the gap between the tire and the wheel was well glued. This also serves the purpose of preventing any dirt from getting in the gap between the wheel and the tire, which can cause the tire to loosen and come unglued. With the preparation completed, I was ready for action. I installed the body, grabbed some posing shots for this article, and headed out to pound the dirt! The great thing about running an electric vehicle is that it’s ready to go from the moment you pull it from the box. 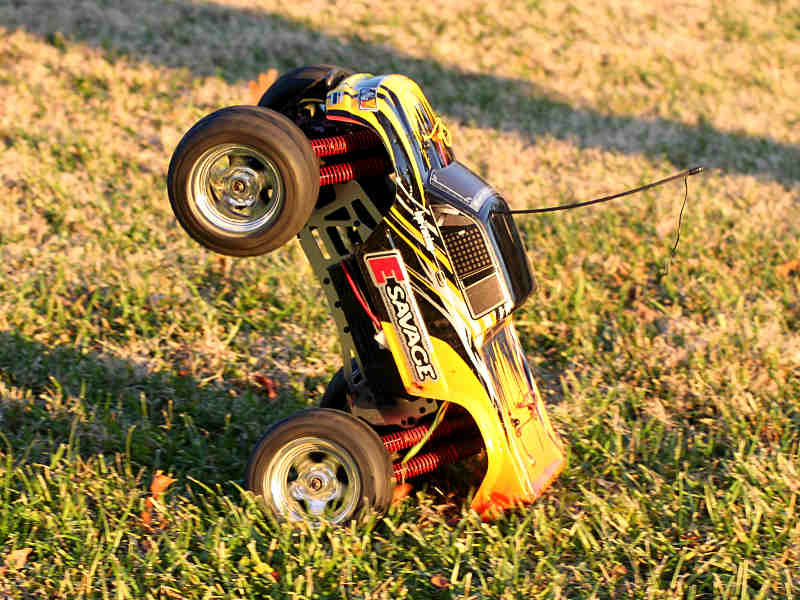 Sure you have to charge the batteries and perform some miscellaneous tasks such as raising the antenna wire, but there’s no break-in procedure needed like you have with a nitro-powered ride. This, and the fact that you don’t have to fool with tuning and throttle linkages, makes an electric-powered vehicle the perfect choice for a beginner. In fact, many veterans choose to stay with electric for this very reason as well. I first headed out to the backyard to get a feel for the truck in a bashing environment, since this truck would more than likely fall into the hands of a backyard warrior. I started running it back and forth to see what kind of traction I’d have available. The stock tires didn’t grip too well, but the majority of the problem seemed to be the acorns that littered the ground. I certainly can’t fault the tires too much for that, as I don’t know of a tire available that’s made to be run on oak tree droppings! The E-Savage blasted through the piles of leaves that had accumulated in the cooler fall weather, virtually disappearing in the resulting colorful tornado of leaves it left in its wake. The truck never seemed to slow down through them though, as the twin 550 motors provided enough power to show the pile that the E-Savage was the boss of this backyard! I hit the dirt ramp that’s set up a few times, and the truck launched itself off with authority into the leaves. It landed close to level, with the nose just slightly off center. As much fun as the dirt ramp was, that was far from where the real fun was though. So I pulled out my curved wooden ramp which is built to get a truck in the air, and prepared for some real jumping! I had noticed the truck seemed to want to take a slight nose-down approach before, but the kicker ramp really showcased this characteristic of the truck. The truck flew high, but need some considerable throttle in the air to bring the nose back up for a solid controlled landing. It took me a few attempts to get a good feel for how I needed to jump the truck, and during that time it took some hard tumbles without a single complaint. Soon, I had the truck landing rubber side down with nearly each jump. After spending some time jumping, I got to thinking about the way the E-Savage liked to jump and figured it would be an easy truck to perform some front flips with. Front flips are generally much tougher to pull off correctly than a backflip, as the backflip is all about grabbing a fistful of throttle. A front flip is more about timing and control. It looked like the E-Savage would make this a much easier task. I took off in a controlled run to the ramp, using as much throttle as I could while keeping the vehicle under control and pointed at the ramp. 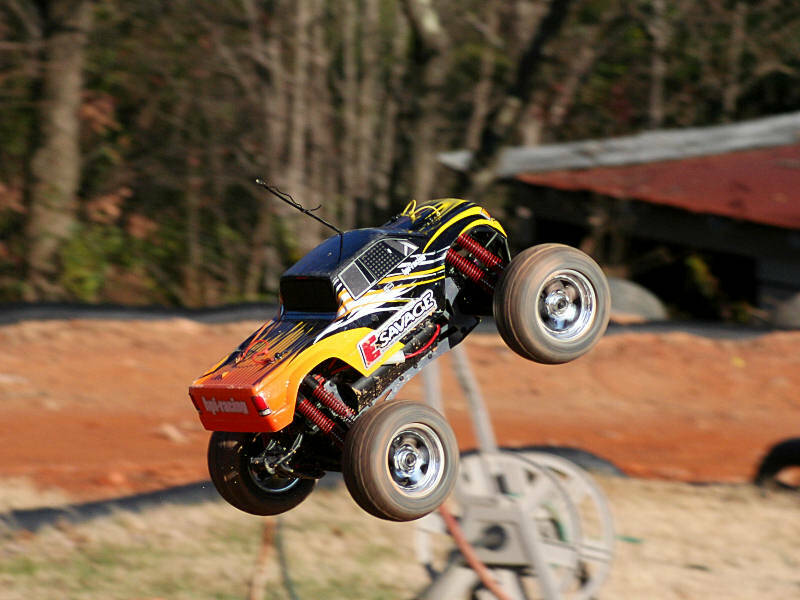 In the split second before the truck left the ramp, and headed towards the sky, I went from throttle to brake to swing the front end down. As the truck spun around and neared a level stance again I reapplied the throttle and prepared for the landing. The first few attempts were close, but not quite perfect. However, just like when I was getting used to hit the ramp soon I had the truck under control and pulling off some very sweet looking front flips! Before packing it in for the day I headed to the front yard and played around in the grass and on the pavement. 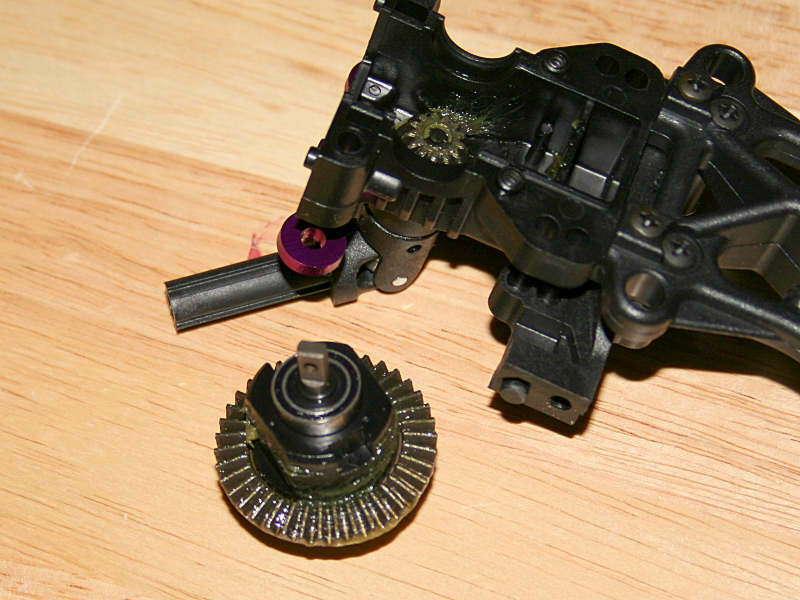 The slipper clutch was set a little conservatively out of the box, which helps prevent any damage to the drivetrain. I wanted to see the front end pick up and the truck pull a few wheelies though, so I made a small adjustment and tightened it up a little. I took small steps when adjusting, as I didn’t want to overdo it with a large adjustment and find myself replacing a spur gear. After a couple of adjustments, sending the nut just over half a round tighter, the truck started pulling the front end up when I stabbed the throttle on the pavement. The grass provided the same amount of traction with the stock tires as well, enabling the truck to take a peek at the sky on command. Out in the grass the truck understeered at speed quite a bit though, because the front end rode along the tops of the blades of grass. This gave the turned front wheels very little bite, forcing me to back off the throttle some to maintain a sharper turning radius. I learned a couple of things in this bashing session as well, aside form how the truck performed. One was that the supplied packs might false peak the first couple of times you use them. So monitor their charge time and make sure the charger doesn’t shut off early. If the pack doesn’t come off the charger warm, it doesn’t have a full charge. So charge it again. Even better would be to charge using a two-amp rate the first couple of times. This will lessen the likelihood of the charger false-peaking. Also, it’s standard knowledge to allow the packs to cool before recharging. Along these lines I wouldn’t leave the packs in the truck if you’re looking for a quicker cooldown. The close quarters of the battery compartment make cool down periods last much longer than if the packs are removed. I imagine most people will use multiple pairs of packs making this a non-issue anyway though. I didn’t stop with that bashing session though. 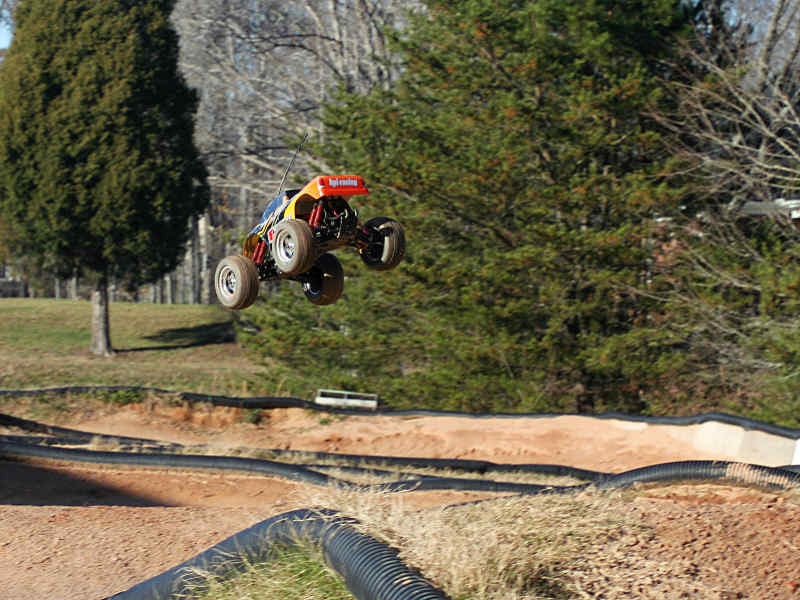 The next day I headed out to Monkey Bottom Raceway. My goal this time out was not really to determine the racing capabilities of the truck, but rather to subject it to a lot of dirt and jumps, again typical of what a basher might encounter. I figured the track would offer a much different set of characteristics beyond what the backyard session the day before did. The first thing I noticed was how much better the truck hooked up in the dirt at the track. There had been some heavy rain a couple of days earlier that week, and some of the corners were standing in water or mud. When I first arrived I worked at cleaning up the portions of the track that weren’t too bad, throwing down some fresh dirt to help soak up the moisture. This kept the tires hooking up very well, much better than I thought they might originally. The end result was I got to put all of the power to the ground, unlike the day before in the backyard. Given the available traction, and the fact that the E-Savage still has the high center of gravity typical with monster trucks, I took a few moments to lower the roll center of the truck. This would help keep the truck under control while I was kicking it back and forth in the dirt. The power the E-Savage provided was easily seen when I hit the triples at the track. 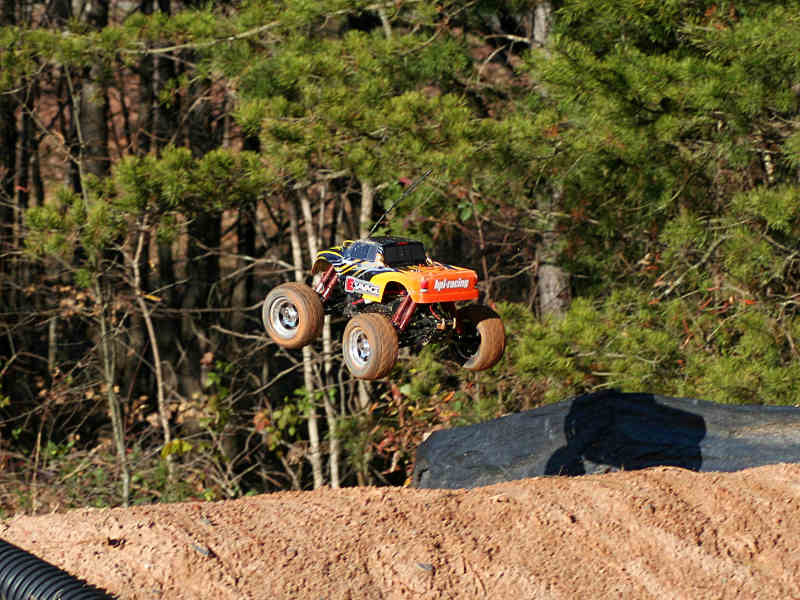 The E-Savage took the section as well as any monster truck, providing enough air to clear the first pair of jumps, and then taking a quick pop over the second. The truck carried enough air to pop completely over the tabletop after that, making a nice nose down landing on the backside. The suspension worked very well, soaking up the jumps perfectly and keeping the composed when landing, even if I had the truck tilted to the left or right. 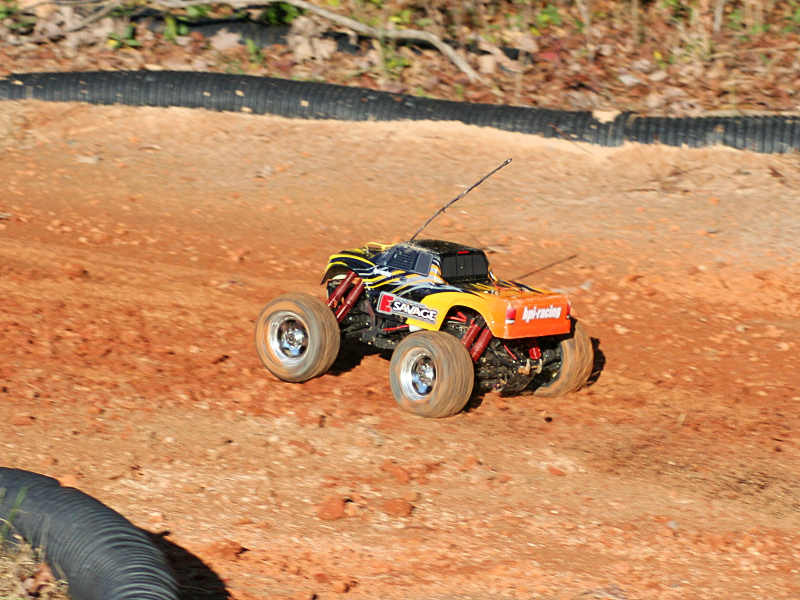 The E-Savage seemed to like one of my favorite parts of the track as well. The back of the track boasts a large two step hill. Most of the time you want to hit the first step and bump over the top, landing on the backside getting a good speed run down the back. The E-Savage pulled this off beautifully, and made for some impressive powerslides through the corner just after the hill, throwing a rooster tail of dirt in its wake! After spending some time jumping, I just couldn’t resist one spot on the track that was standing in mud. 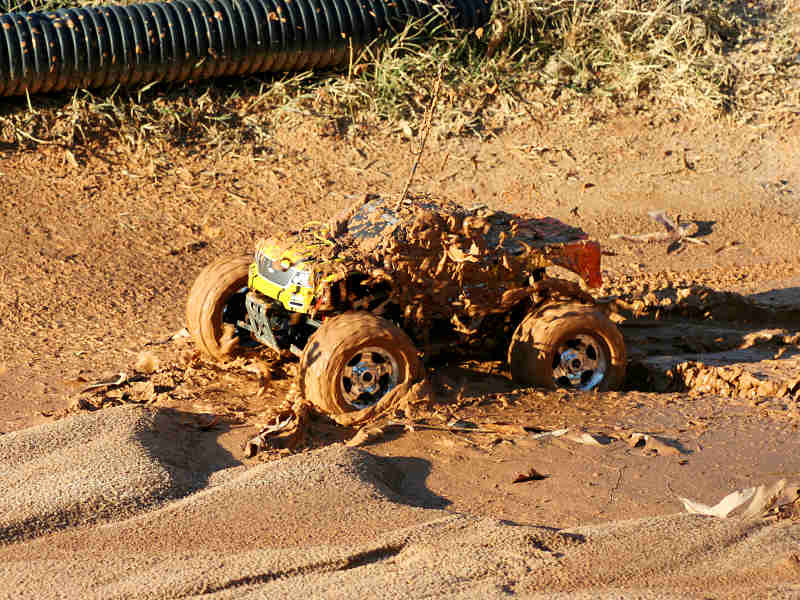 The mud was thick, looking like someone had dumped a ton of pudding just after the first turn. I knew this would make for a killer set of pictures, as well as some fun watching the truck sling the mud off its tires. The spot was small, probably only twice the length of the truck, but it was easy to bury the tires deep down in the mud, allowing the E-Savage to get super dirty! I manned the camera, while my fourteen year-old drove the truck forwards and backwards through the mud. 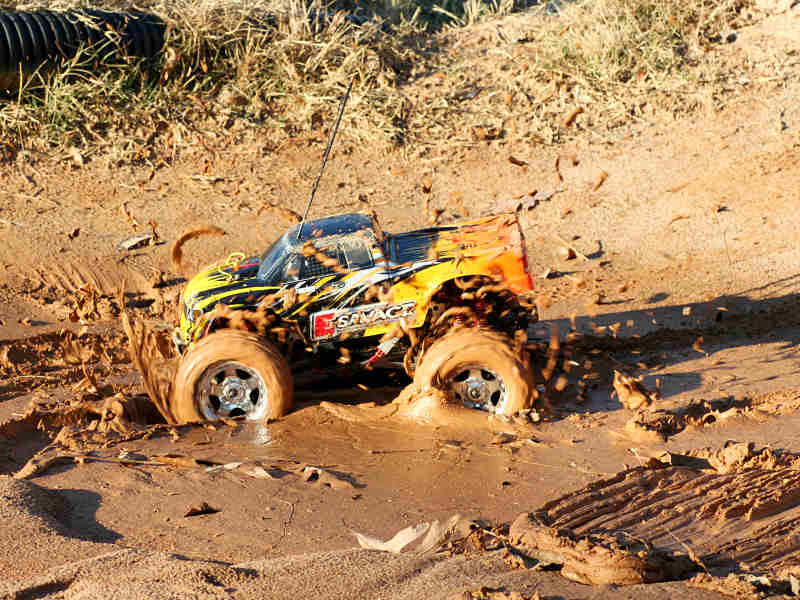 Its four-wheel drive capability kept it moving through the mud without getting stuck at all. By the time he was finished the body was absolutely covered in mud, obscuring the factory colors and branding. It made for one heck of a clean-up, but was good times indeed! After spending the day at the track, it was time to begin reflecting on my experiences with the truck and to prepare for writing this article. I know one question that will be on the mind of those who are looking to purchase the truck, and that is runtime. The stock 3300Mah packs provided me around 10-12 minutes of runtime, although that may vary from person to person. Driving style will greatly affect your runtime, as someone who always has the throttle nailed will likely see less runtime than someone who is on and off the throttle more. The truck has good power, and radar testing showed me a top speed of right at 26MPH with the stock battery packs. Nothing on the truck broke during the time I beat on it at the track and in the backyard. However, the chrome plating on the wheels had started to flake off a little. This is typical of chrome plated wheels though as chrome coating just doesn’t bond to plastic very well, nor does it flex when the wheel does. In looking at the mud-covered and beaten ride when the day was finished I can honestly say it’s been through the wringer, and the truck is still standing proud! 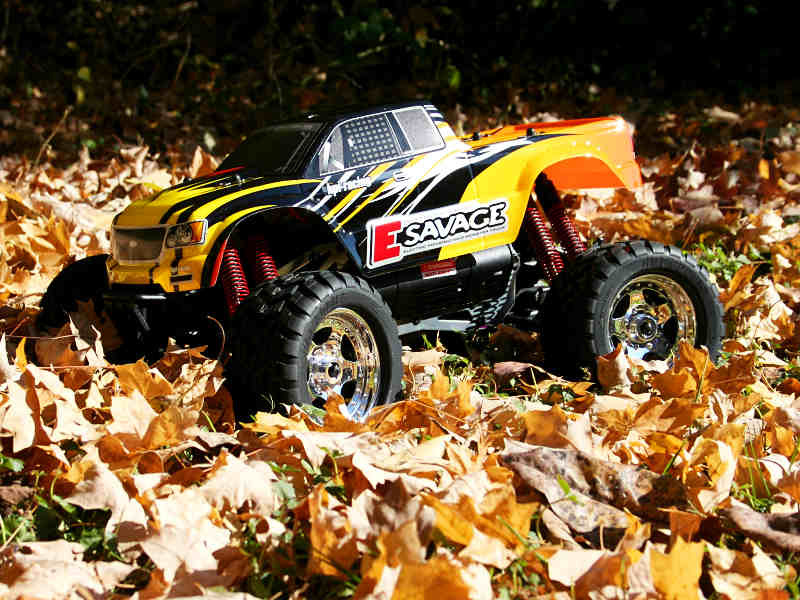 The HPI E-Savage can certainly say it delivers when it comes to fun and ease of use. The GT Escape charger makes prepping the batteries ready for a run easy with it’s straightforward controls, and the truck is tough enough to withstand plenty of punishment from the bashing crowd it’s targeted towards. In short, the truck embodies everything the original version of the Savage stands for. It just provides a truck that’s easier to operate for novices or those who may not care to have to tune a nitro powerplant. 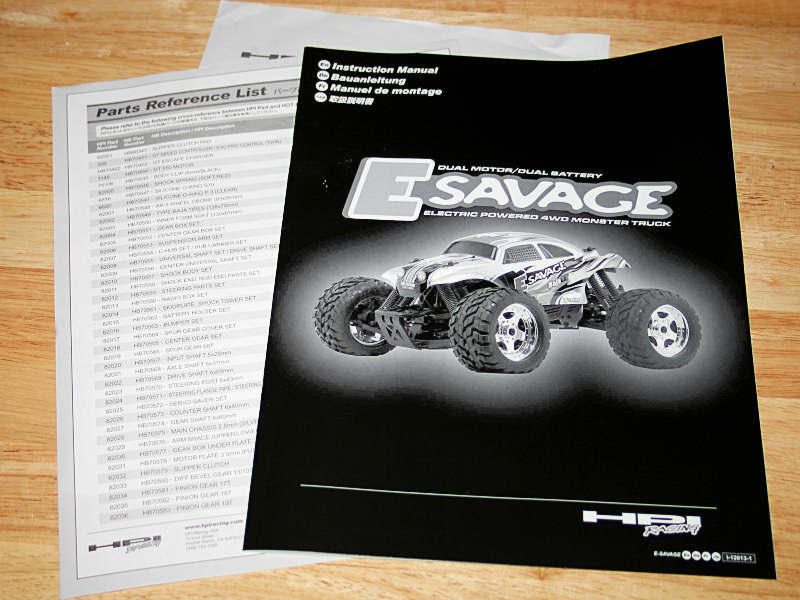 It would be hard for HPI to make much of an improvement upon what they already offer with the E-Savage. The truck offers a very well-rounded package for its price, making it a very attractive model for those seeking an electric four-wheel drive truck. About the only area that I see that could make a huge difference is the charger. The charger itself works great and is easy to operate, but the lack of AC capability hinders it some. While the owner can pick up a power supply to use the charger with household current, it would be nice to see this capability provided right out of the box. The Savage has had a big fan base since it was released several years ago. I’m surprised it took this long to introduce an electric version, as it seemed like such a natural progression of the platform. I attribute much of this to the fact that the two trucks differ substantially in size and the parts they use. So it was not simply a matter of retrofitting electric components onto the original Savage. Regardless of the reason, now that it’s released, I expect the E-Savage will extend the familiarity of the Savage name throughout those who spend their time in the monster truck genre of the hobby.